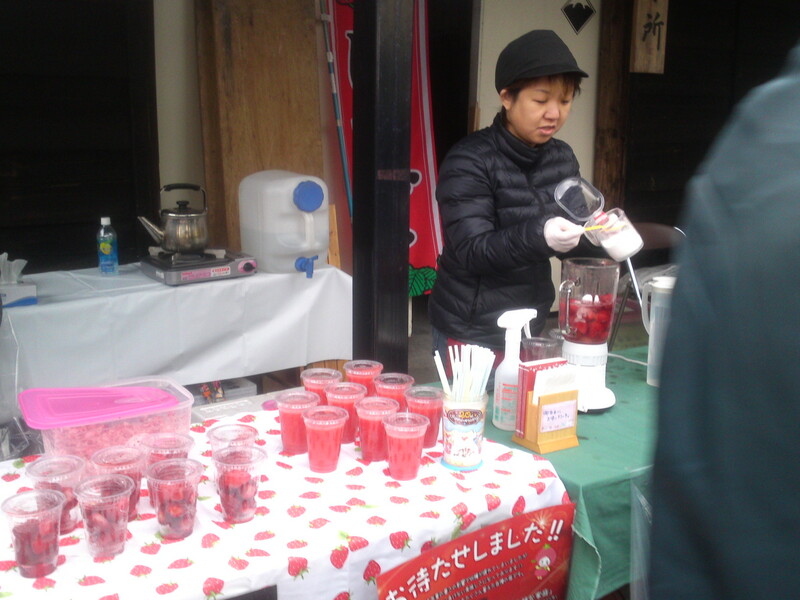 It is a honjozo, meaning that it was blended with water and pure sake alcohol after pressing. 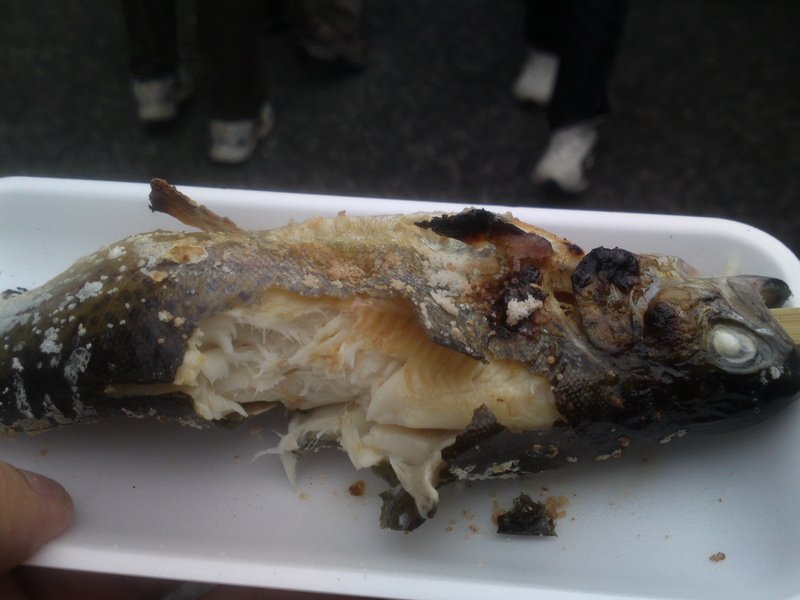 Its name “Suruga no Kuni” means the “Country of Suruga”. 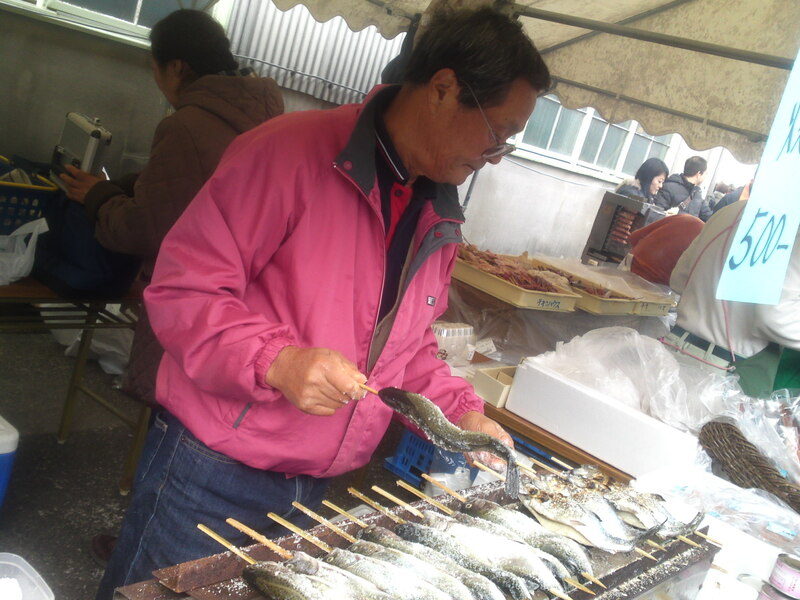 Suruga is also the name of the wide bay off Shizuoka Prefecture. Aroma: Assertive, fruity and dry. Complex. Banana, dark chocolate, vanilla. Taste: A very distinct attack, fruity and dry. Very complex. Starts almost sweetish to take a very dry turn with a solid and pleasant alcohol backup. Disappears fairly quickly while warming up the back of the palate with dry nuts, walnuts and chestnuts finish. Dark chocolate and coffee beans tend to peek out later. Changes little with food, although more dryness will appear later. Overall: A very solid but elegant sake pefect for food, especially izakaya gastronomy and Western meat fare although it is thoroughly enjoyable on its own. At 60% millage it is simply an extravagant honjozo! 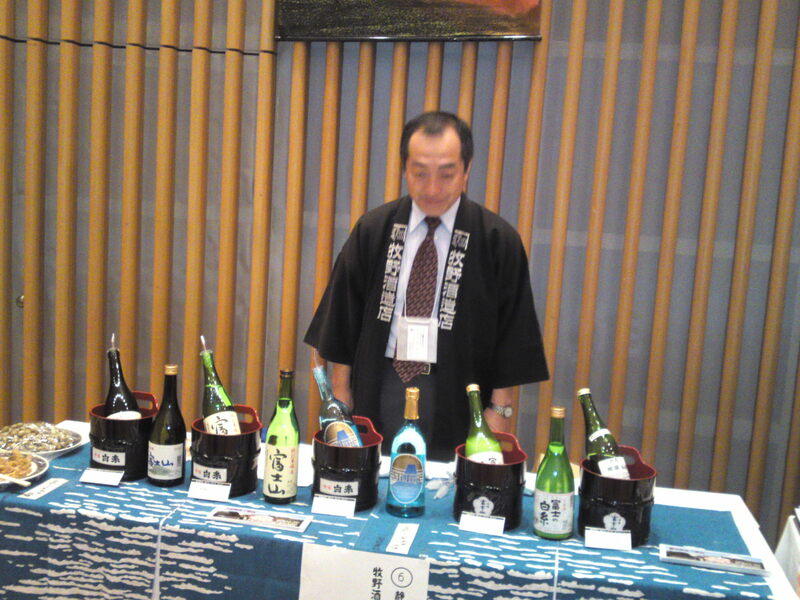 A sake for all seasons, very macho in approach by Shizuoka standards! She looks cute, doesn’t she? Oomuraya Brewery in Shimada City is celebrated for its brand “Oni koroshi/Kill a Goblin”, meaning that the sake is so good it would overwhelm a Japanese ogre. Now, the brewery has come up with a dangerous “partner”, “Oni Otome”/ “The Goblin’s Sweetheart” and topped it with “Yume/Dream”! Brrrr…. Aroma: Assertive, fruity, sweetish and flowery. Taste: A little dry attack backed up by junmai petillant. Fruity and complex. Elegant. Pineapple, oranges, faint dark chocolate. Lingers for a while warming up the palate. Ending on a softer dry note with almonds and cherries. Turns on a lighter note with food along an accent on oranges. Overall: A sake probably best enjoyed on its own or as an aperitif. Tends to a back seat with food. 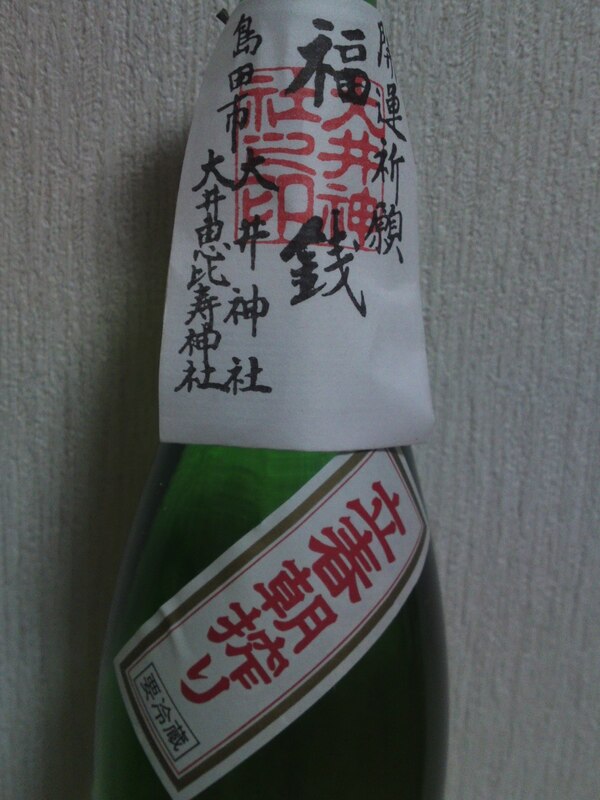 A sake which should please the younger generation and ladies in particular. 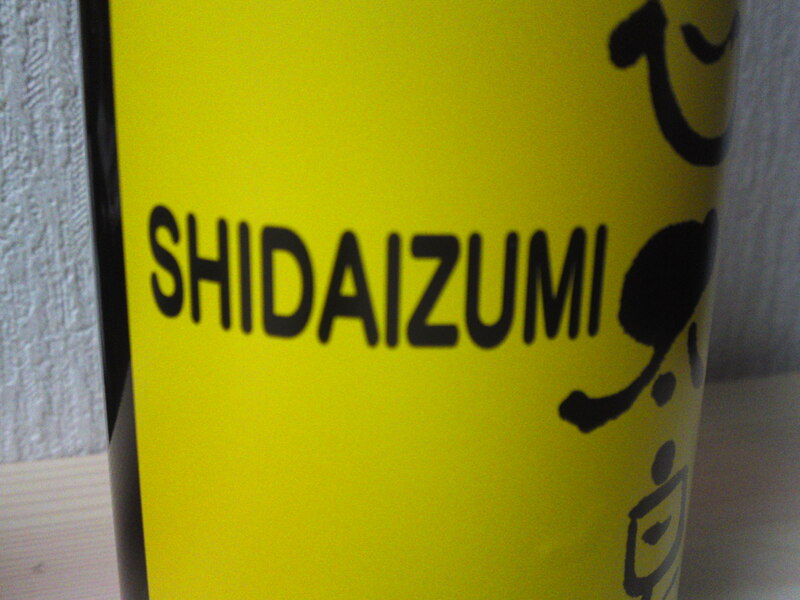 Another long name for an annual limited nectar by Oomuraya brewery in Shimada City! 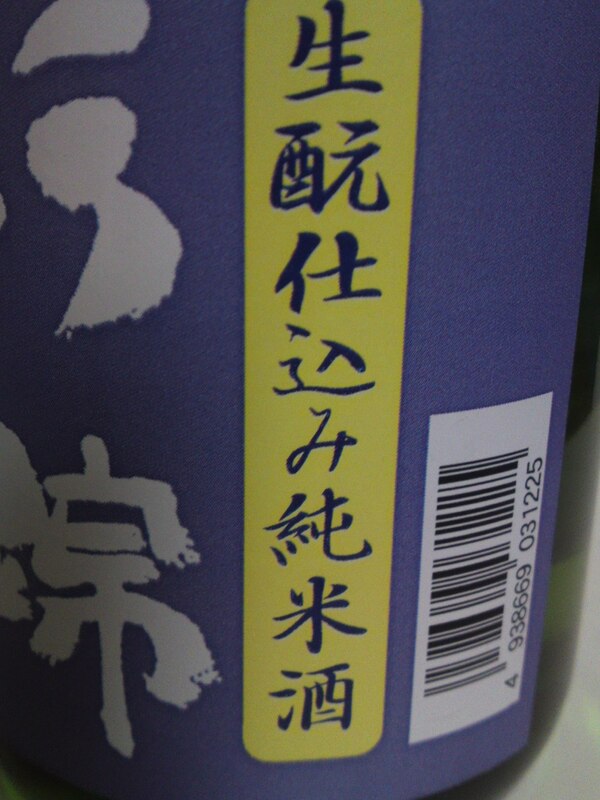 Now, what does “Oomuraya Brewery-Wakatake Tate Haru Asa Shiboritate Junmai Ginjo Nama Genshu” stand for? “Wakatake” is the name of Oomuraya Brewery’s main brand name. 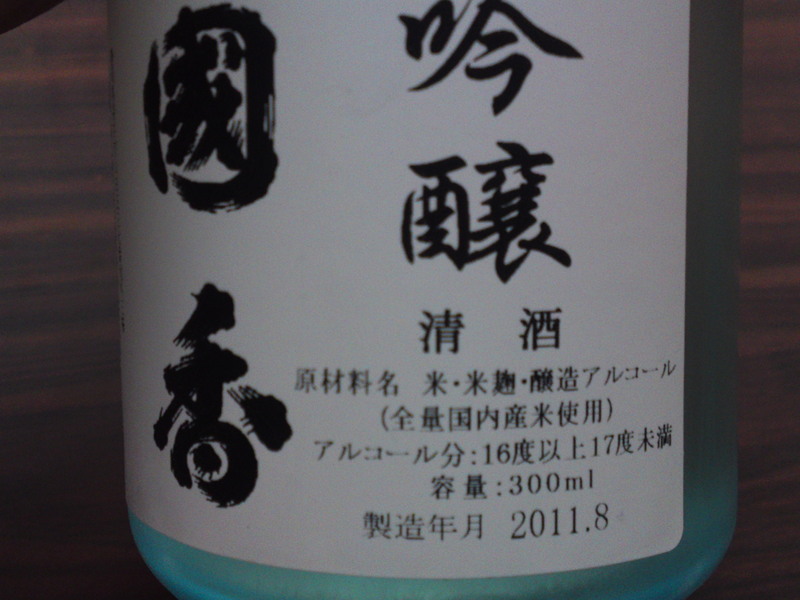 “Risshun Shibori” means this sake had just been pressed on a Spring morning. 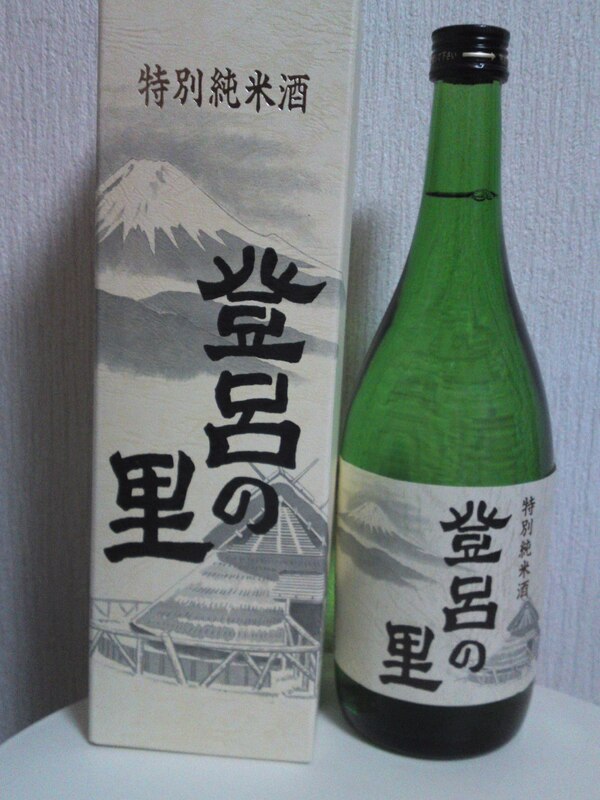 “Junmai Ginjo” is a premium level for a sake to which no alcohol was added. “Nama” means it was not pasteurized. 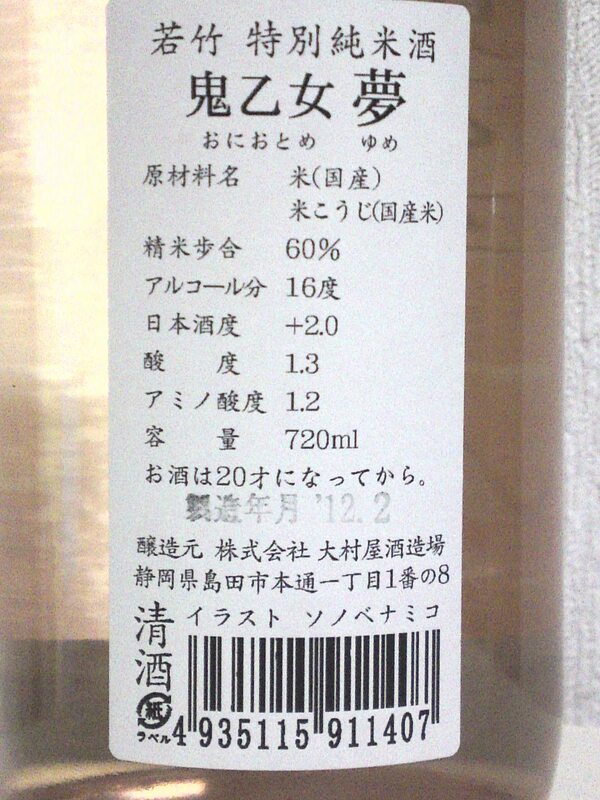 “Genshu” means that no water was added. A sake as it came out of the pressing! 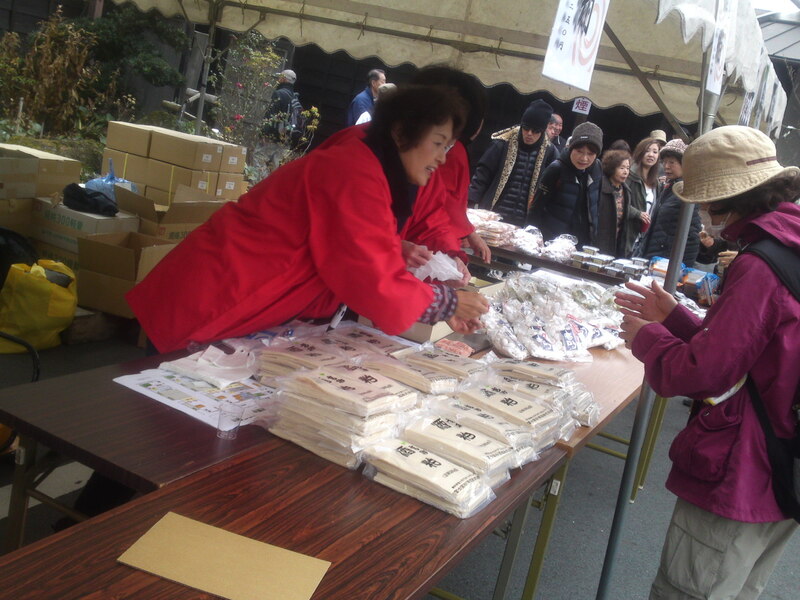 The paper envelope attached to the neck contains a five yen coin for good luck! 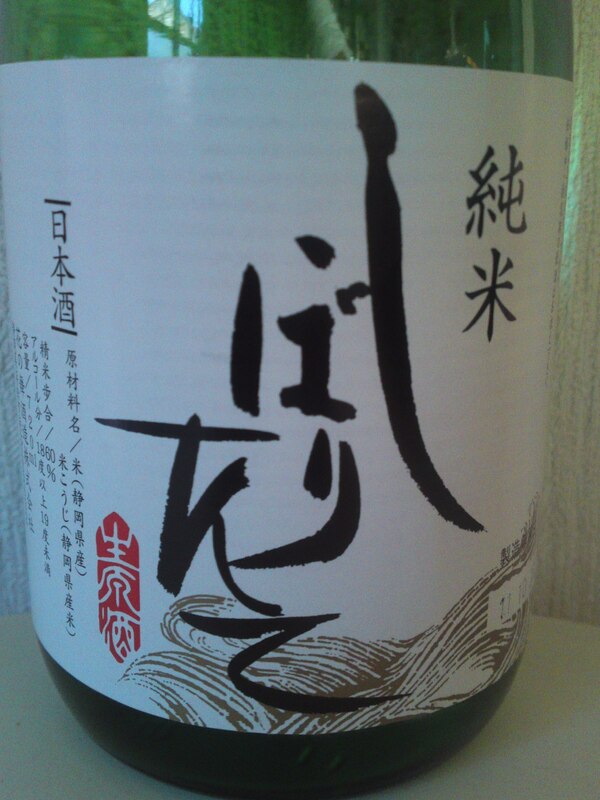 Taste: Strong attack backed up by pleasant alcohol and junmai petillant. Fruity and complex: banana, oranges, vanilla, pears. Disappears on a dry note with almonds and macadamia nuts. Great balance between fruit and acidity. Changes little and drinks well with any food. 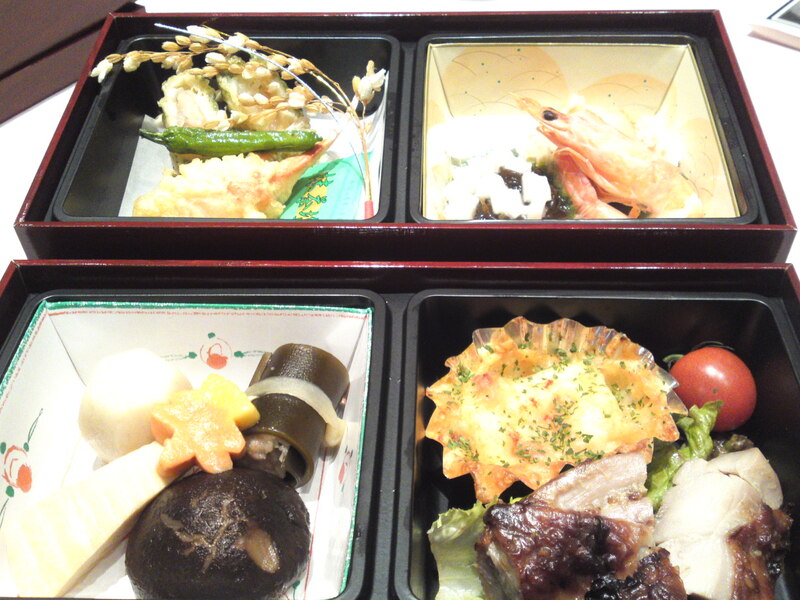 Overall: A traditional limited brew typical of Oomuraya Brewery’s approach. 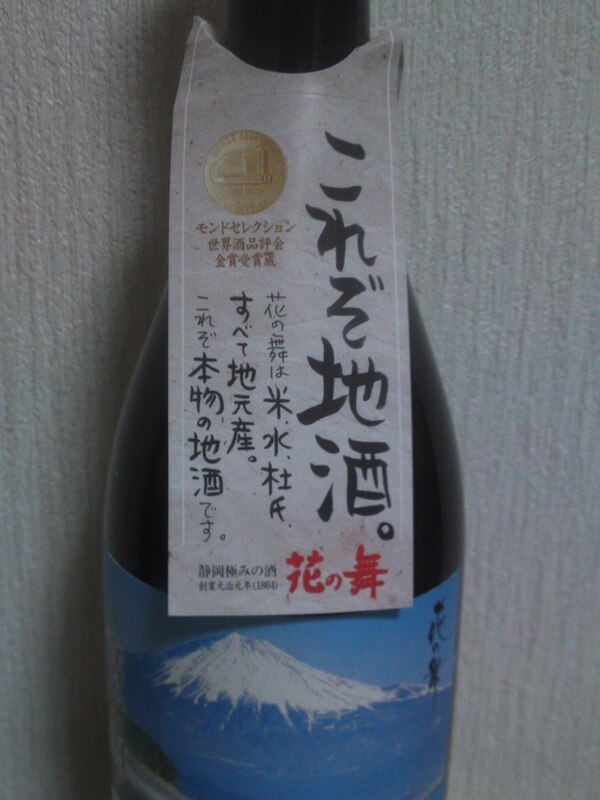 A very solid and strong sake, but nonetheless elegant in its superlative balance between fruit and acidity. 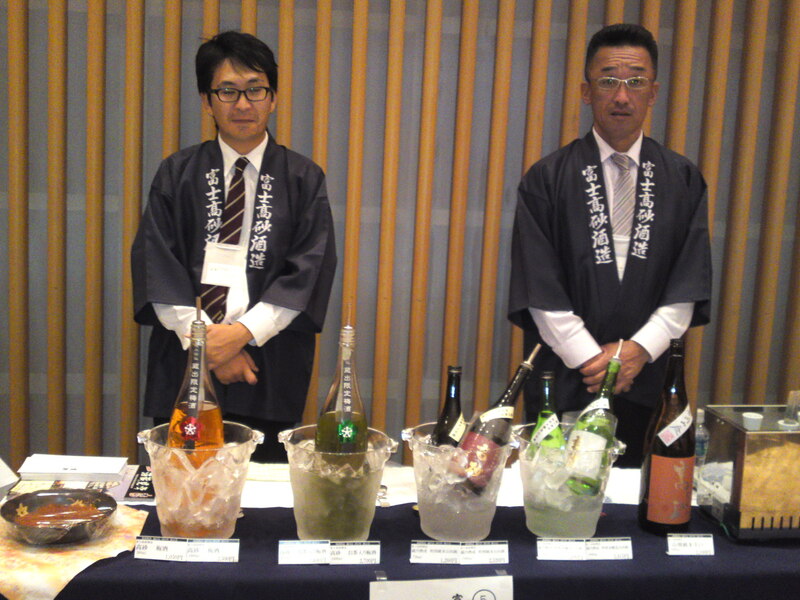 A sake perfect with izakaya gastronomy! Negami Brewery has the particularity to be situated at a height of 550 meters on the slopes of Mount Fuji! This means the water used for brewing their sake gushes out of the very mountain! I love the traditional Japanese design! The crane and turtle/tortoise in Japan are symbols of good luck! 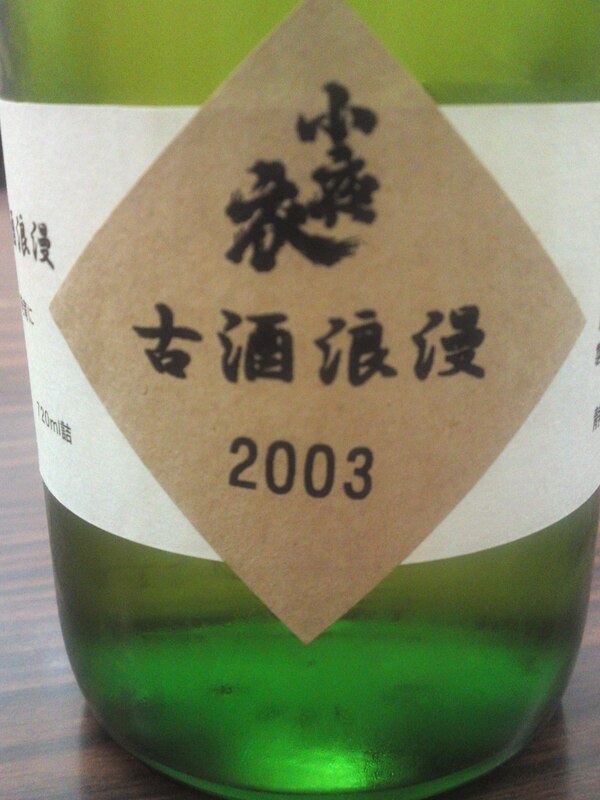 Taste: Dry and fruity attack backed up with soft junmai petillant and pleasant alcohol. Complex. Oranges tend to dominate with some nuts and dark cherries. Disappears fairly quickly on a drier note. Varies little with food, although make a short turn to sweetness but will turn back again very swiftly to a drier note once away from food backed up with more oranges and dark cherries. 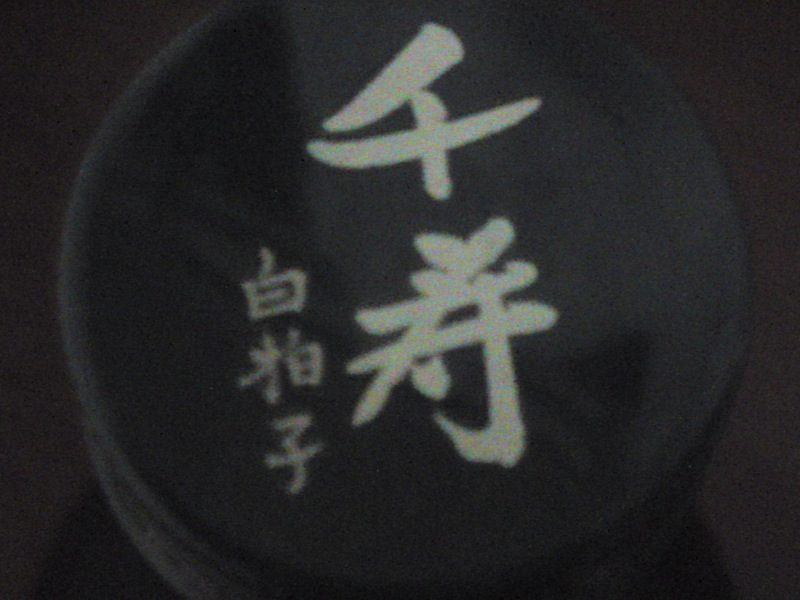 Overall: A very pleasant sake, if a bit strong, to enjoy on its own or with any food. 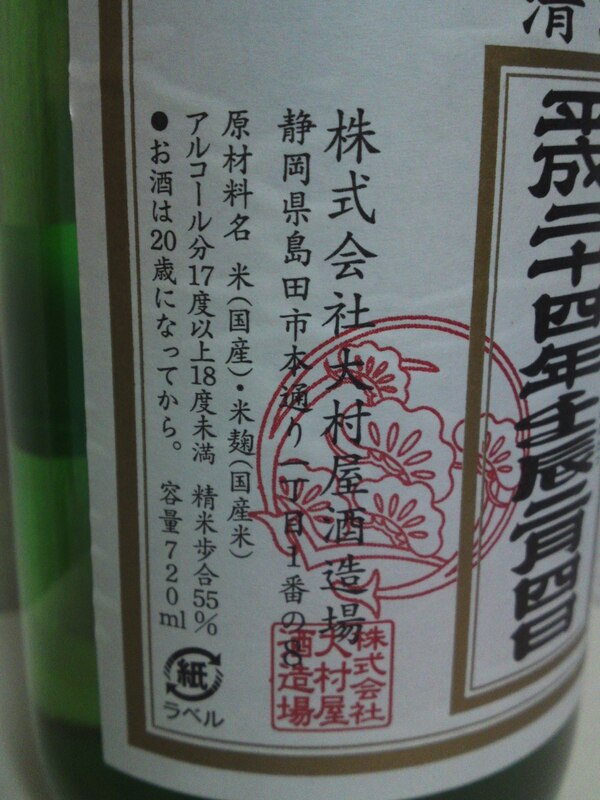 Despite its extravagant millage (55% for a junmai!) 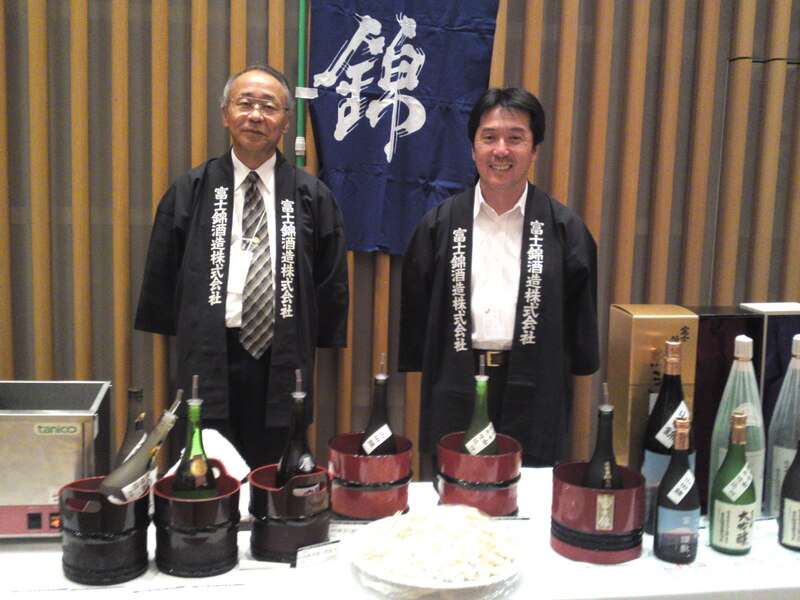 it is a sake most suited for food thanks to its high alcohol contest! A sure value at any time! 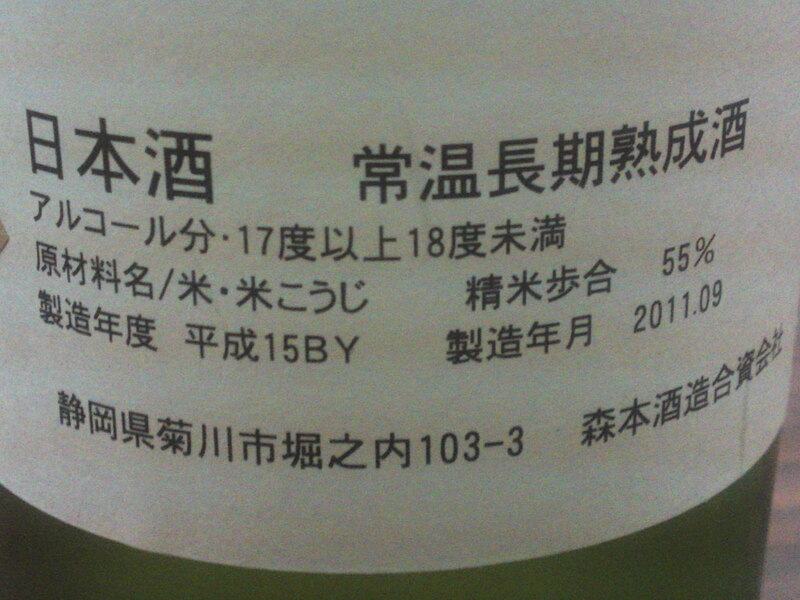 This must have been the longest title for introducing a sake made in Shizuoka Prefecture! Hana No Mai Brewery in Hamamatsu City made a point to tell everyone this is a true local sake as the rice is Homare Fuji sake rice grown only in Shizuoka Prefecture and as the water and yeast are also all from our Prefecture! 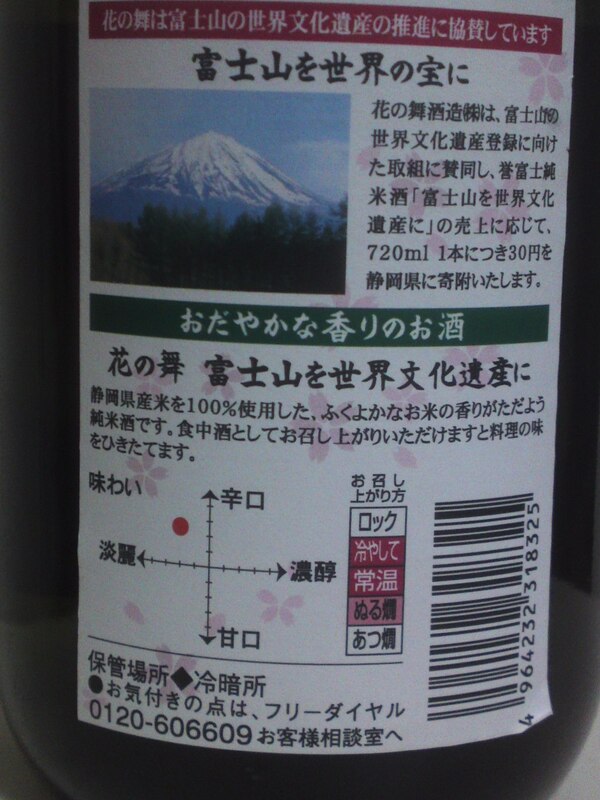 The Homare Fuji Sake Rice label was originally designed in the shape of Mount Fuji by a University student! 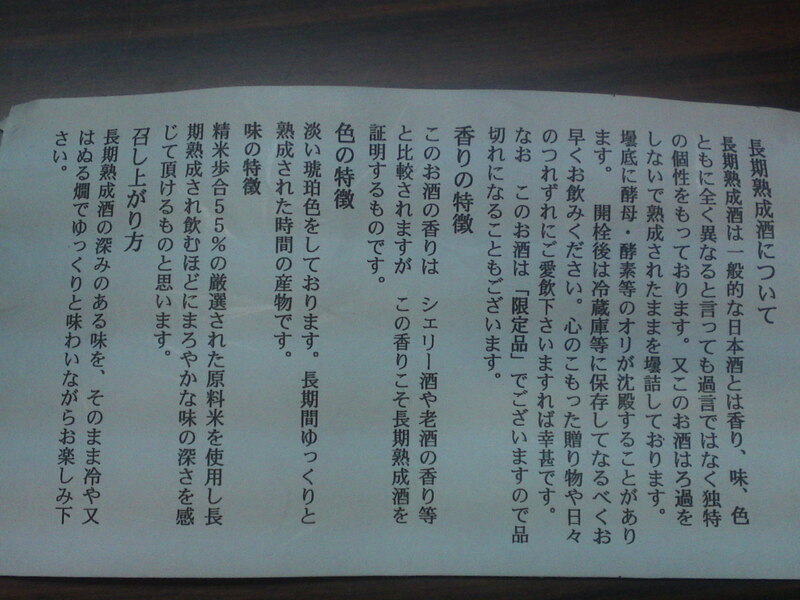 Hana no Mai Brewery is also advertizing the fact that Japan has applied for recognition of Mount Fuji as a World Heritage Site, both in English and Japanese! Incidentally, February 23rd has been designated at Mount Fuji Day! 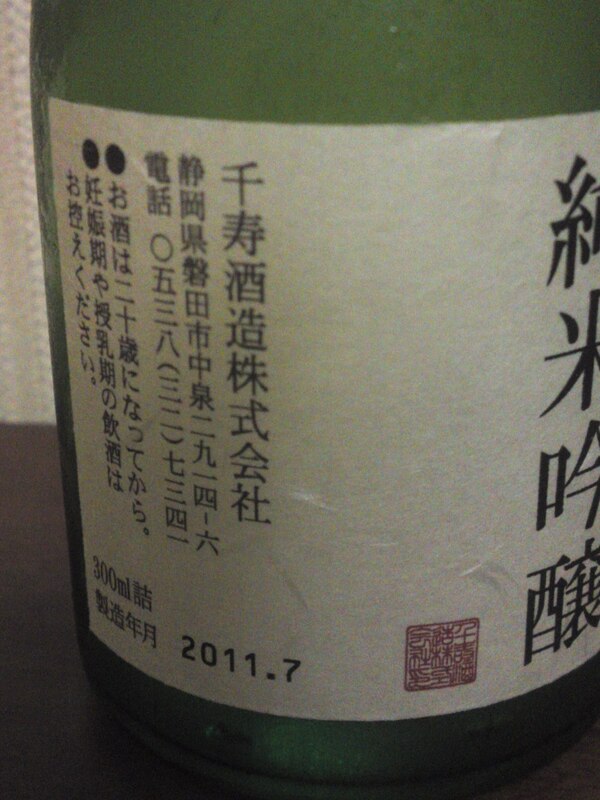 Taste: Fruity attack backed by strong junmai petillant and pleasant alcohol. Varies little with food except for turning a little drier. 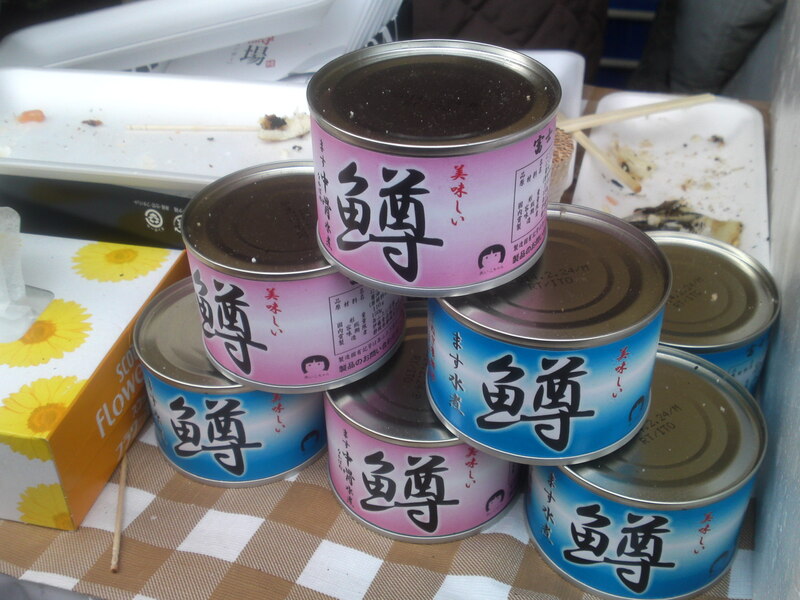 Junmai petillant makes a strong comeback with oranges and coffee beans after food. Overall: A sake obviously designed for food. 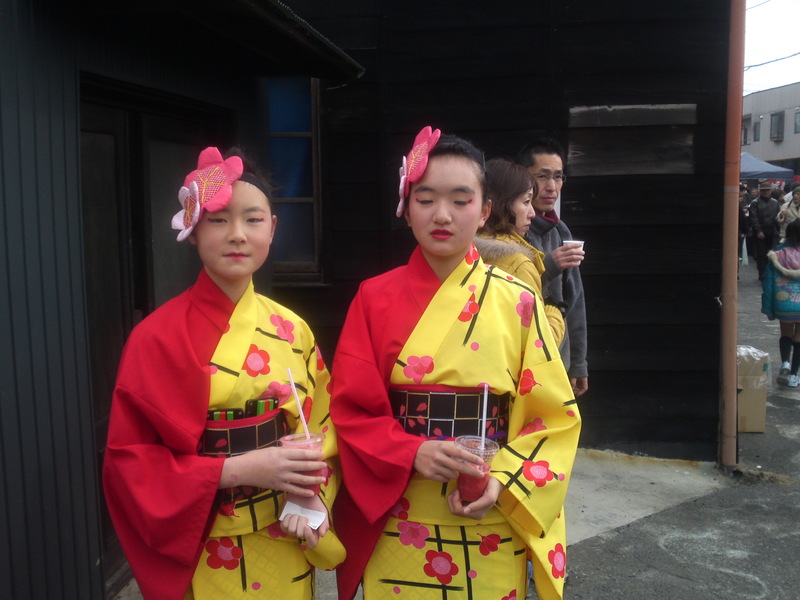 Typical of Hana no Mai Brewery in that it will please young people and ladies. 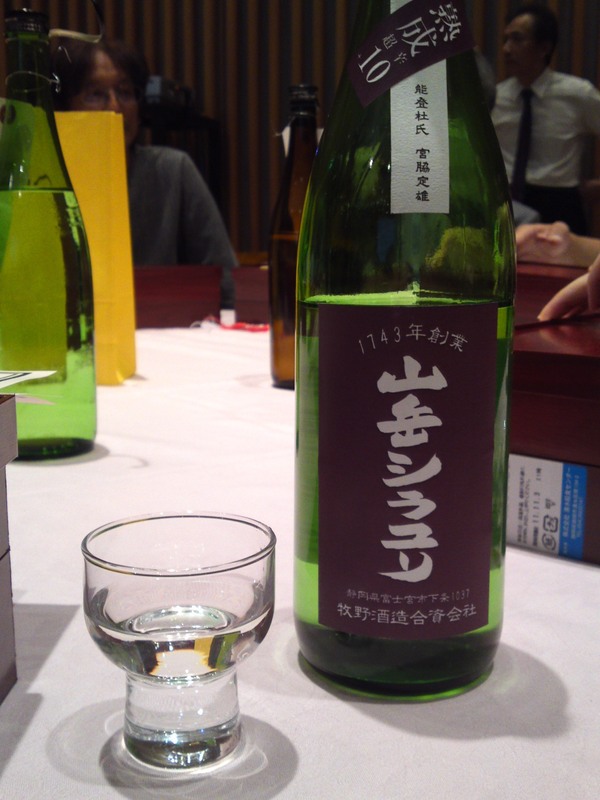 No wonder it is a popular sake in local izakayas patronized by young people! 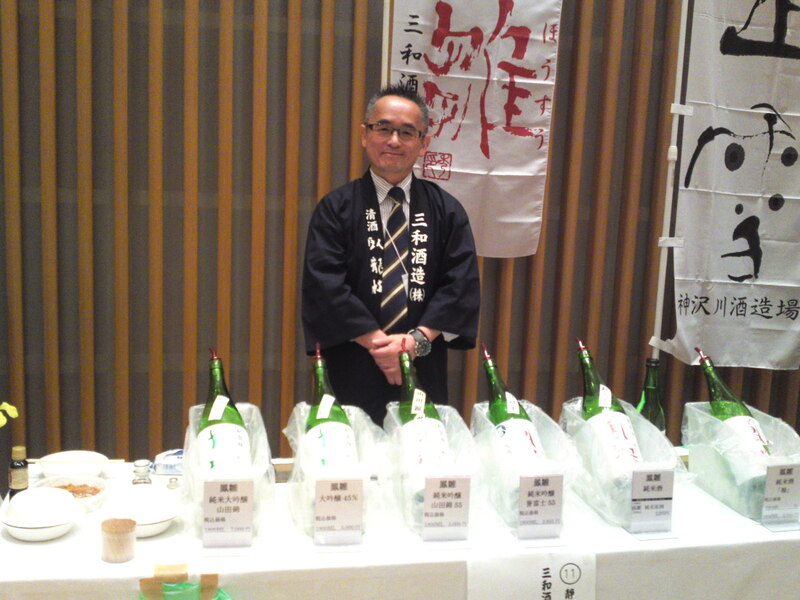 A sake to be appreciated chilled, at room temperature or lukewarm/nurukan! The whole 250 years old brewery has disappeared from the surface of the earth to leave way to ugly development, but fortunately Suruga Brewery not only bought all the sake created by Masterbrewer Haruki Nakajima with the license but also continued using the brand names of Chuumasa, Abekaidou and Onigoroshi! 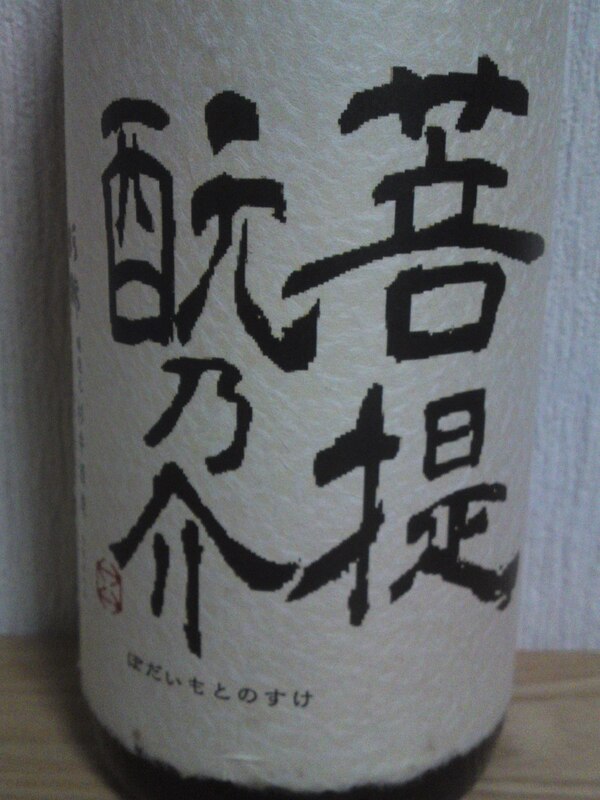 Suruga Brewery bottled this Chuumasa sake created by Brewmaster Haruki Nakajima in 2007 in November 2011! Aroma: Fruity and elegant. Pears, oranges. 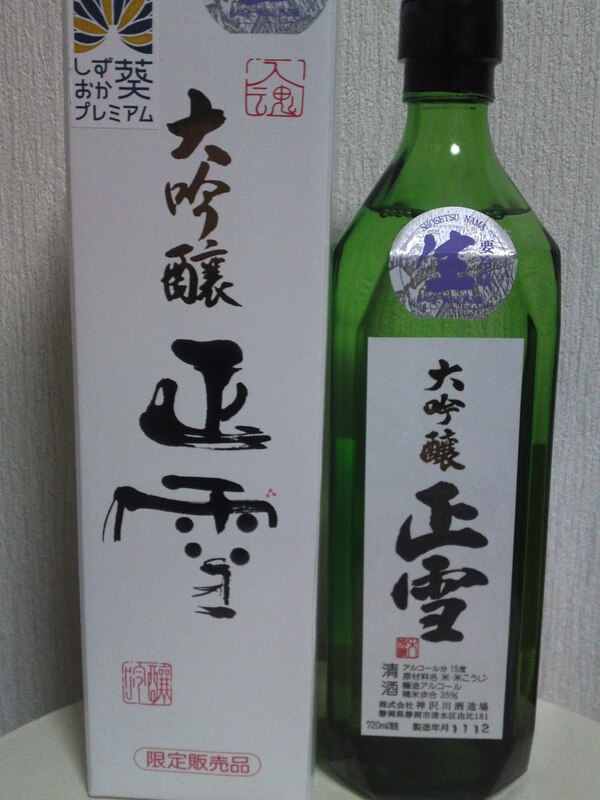 Complex with pleasant alcohol attack (practically a genshu). Elegant and softer than expected in spite of its high alcohol content. Gets drier with food with a big kick from the alcohol. Tends to make a sweet comeback with more oranges away from food. Surprisingly marries well with any food. A rarity in the sense that it is a daiginjo that ladies should find to their liking for its soft approach in spite of the high alcohol content. 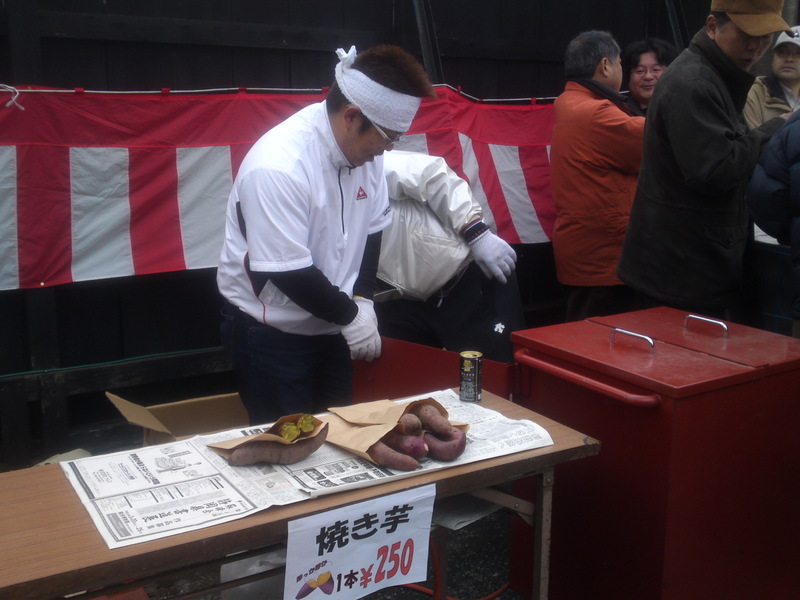 Japanese Gastronomy: Fuji-Takasago Brewery Public Opening with Sanoman Delicatessen in Fujinomiya City! 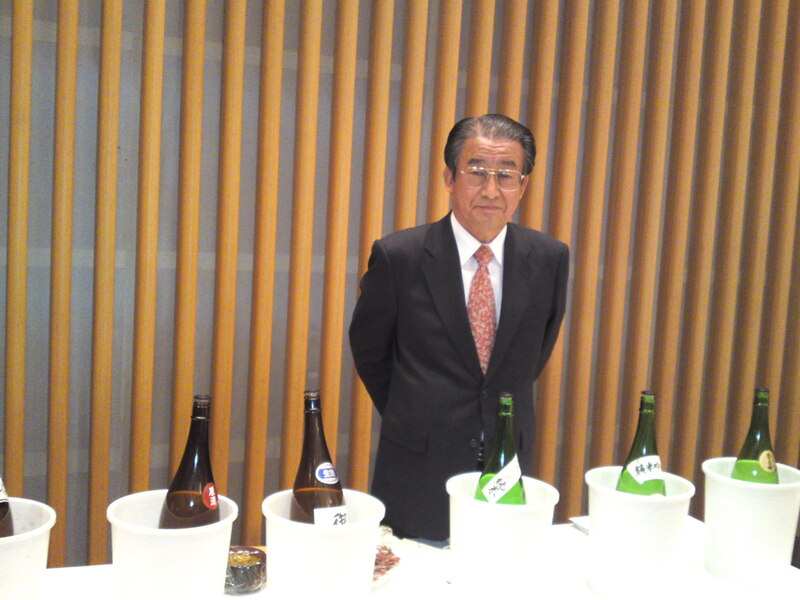 For the last 8 years or so Fuji-Takasago Brewery has been holding a Brewery Public Opening Day on their premises in Fujinomiya City with the collaboration of Sanoman Co., the largest delicatessen company in the Prefecture. 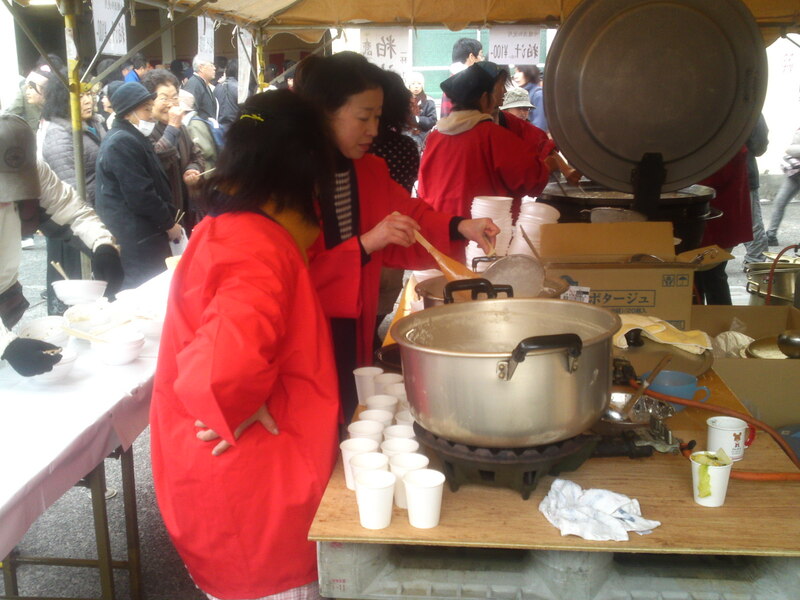 The event is attracting a lot of attention from the whole of Shizuoka Prefecture as demonstrated by thousands of visitors from all corners of the Prefecture! 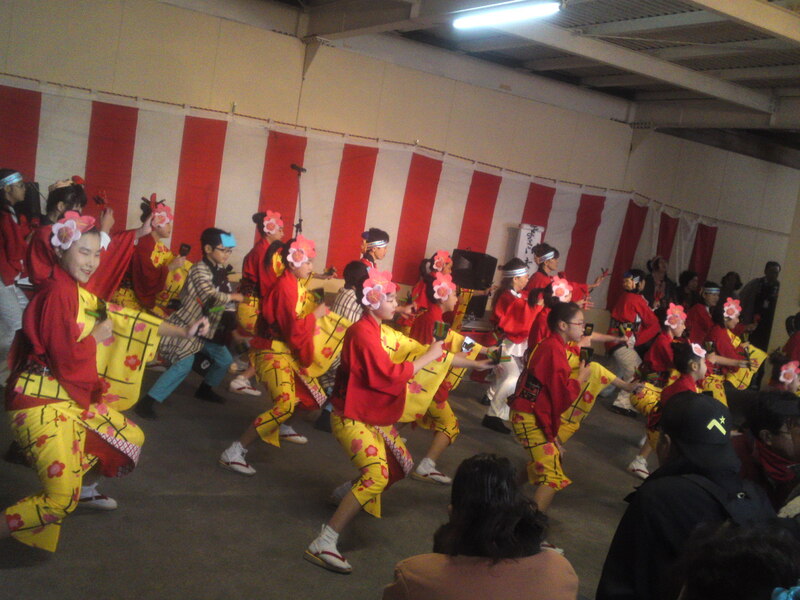 The joint event has become a reference for an ever-growing number of similar festivals in Shizuoka! The train saw a lot of people going down at Nishi Fujinomiya Station at a walking distance from the Brewery. 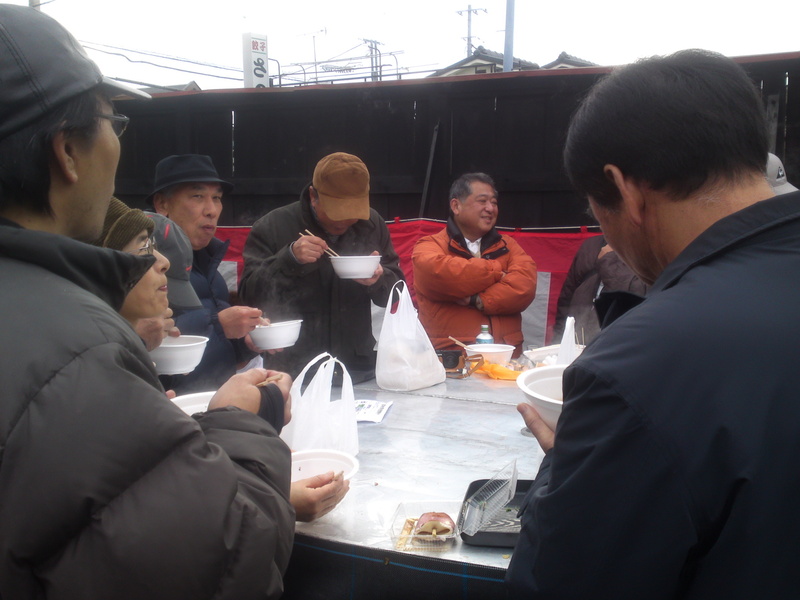 Some of them took the opportunity to eat hot pork soups at Sanoman Co. which stands on the other side of the street! They were the more welcome by the cold weather! 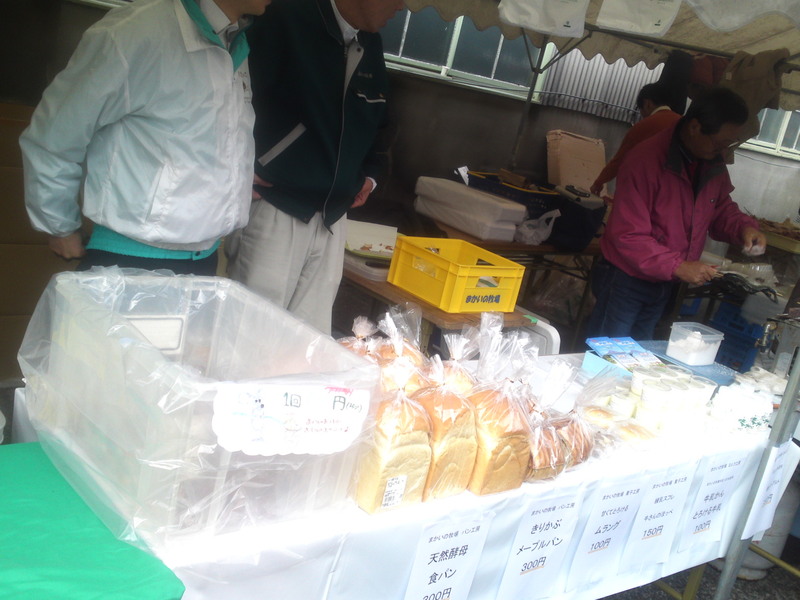 I had a quick look inside Sanoman Co. as I knew quite a few of their products would be on sale on the Brewery premises! 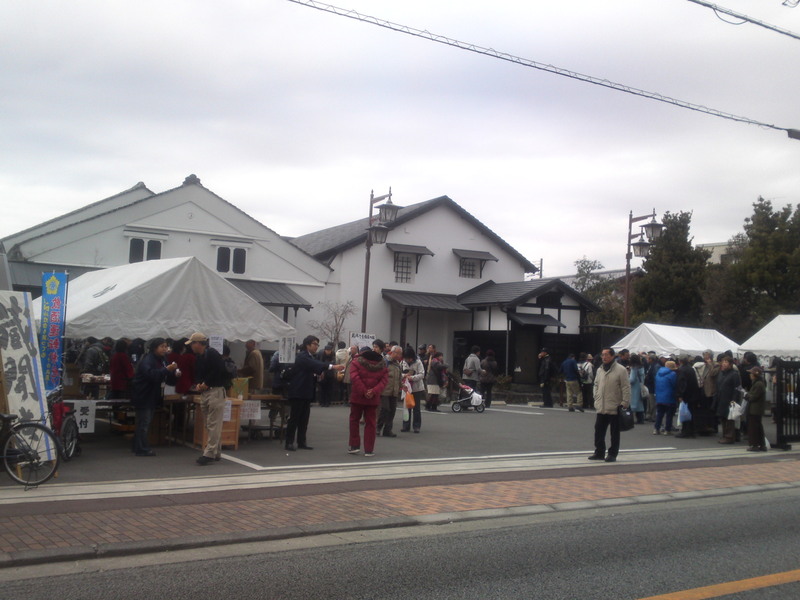 And then we had only the street to cross to enter Fuji-Takasago Brewery! The whole staff with their young owner were busy welcoming everyone! 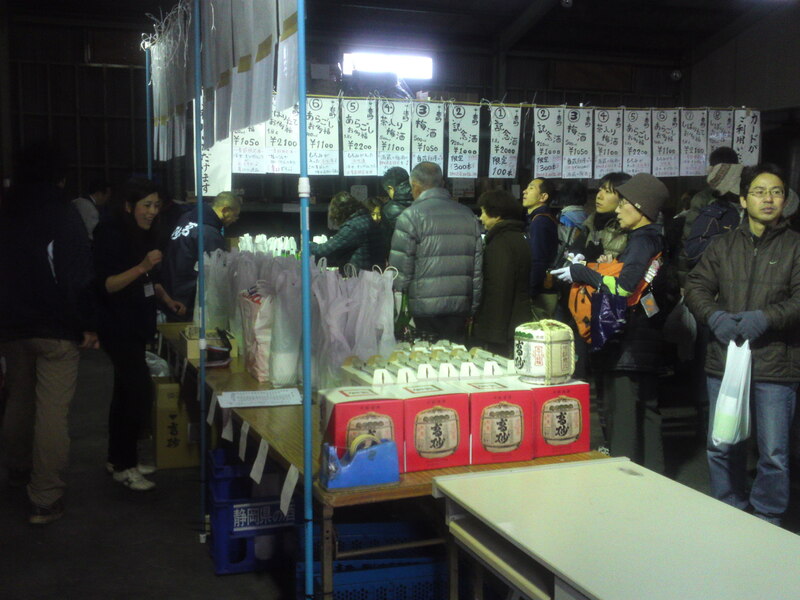 Take note of the Fuji-Takasago sake kegs! 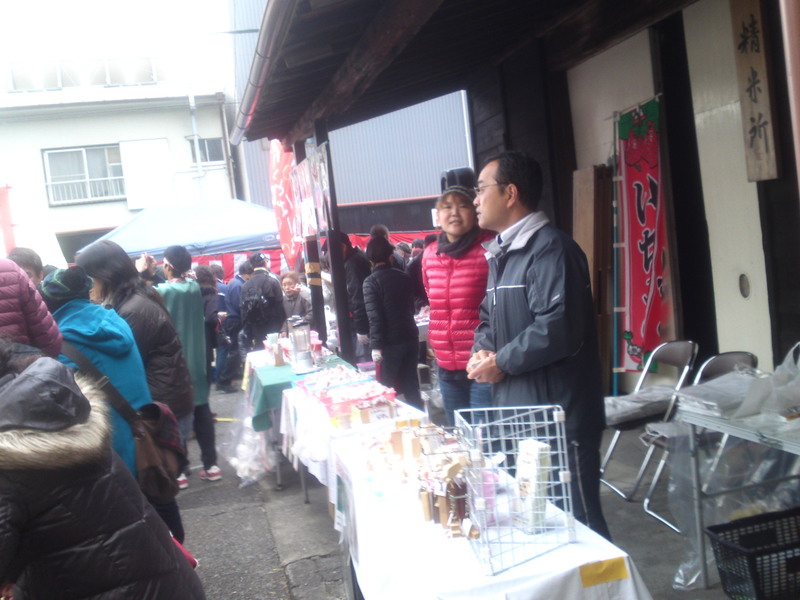 Quite a few notable visitors were already enjoying themselves including Kenya Yoshimura, owner of Uzu Restaurant in Shizuoka City! 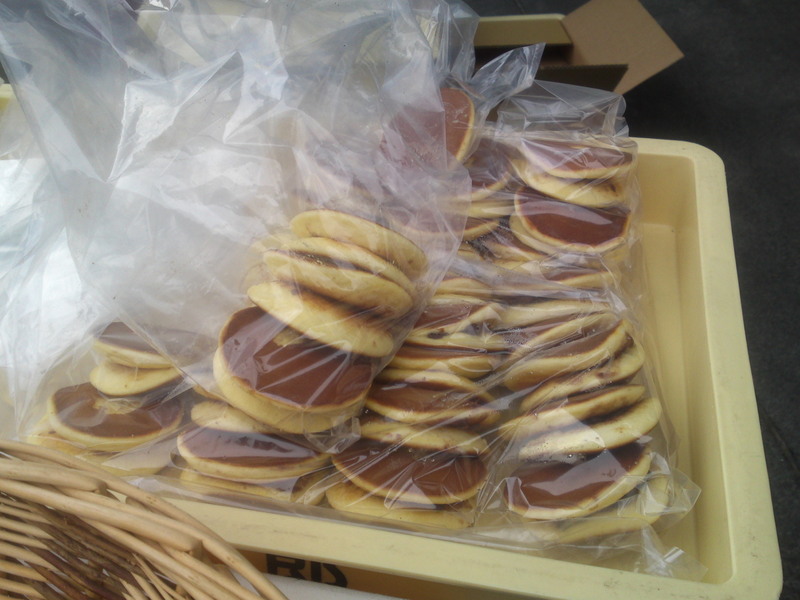 Sakekasu/sake white lees were on sale for customers who will use them for amazake/sweet sake or nabe/hotpot back home! 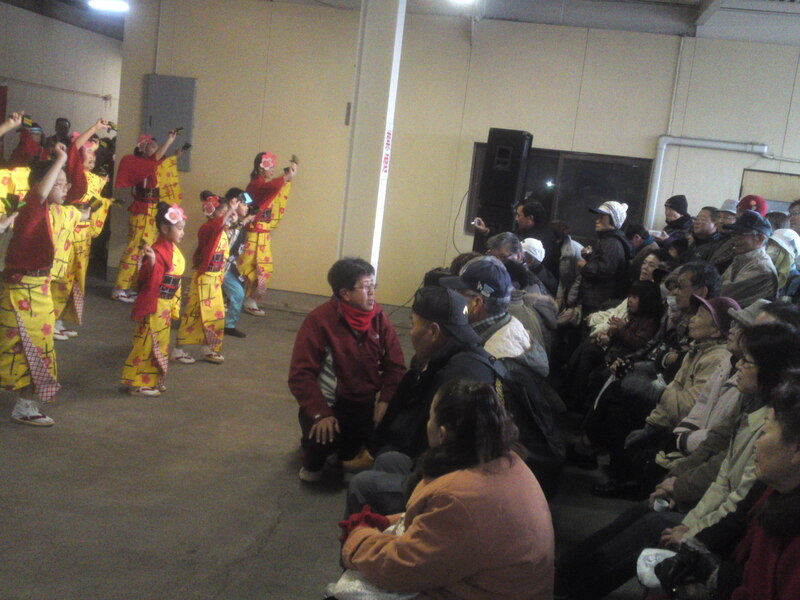 Visitors were even treated to a show by local folklore dance groups! 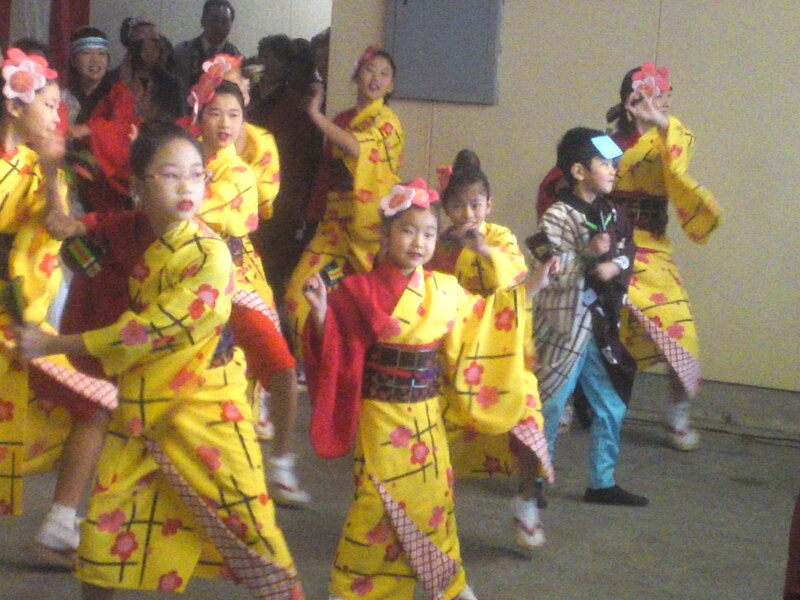 Cute kids taking part in the dance! 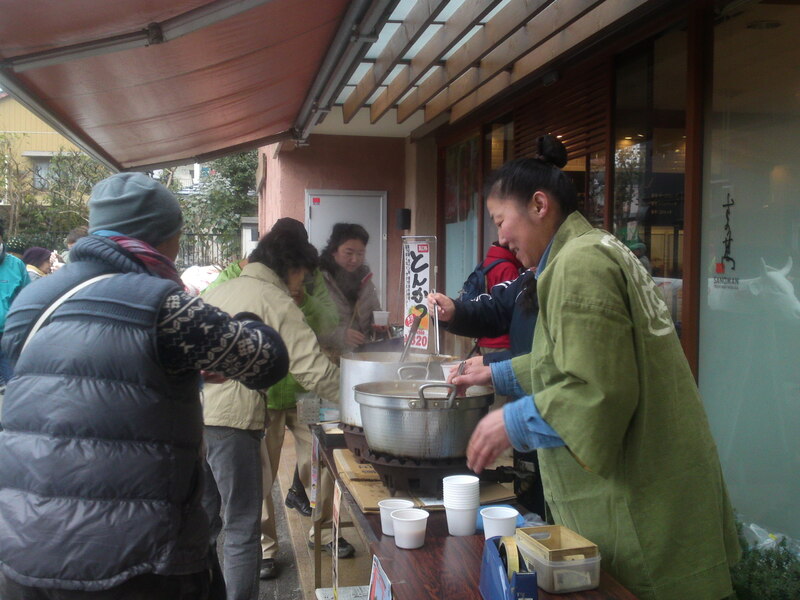 But my first destination was the sake served for free by the brewmasters (Noto School) themselves! Directly from the brewing tanks! 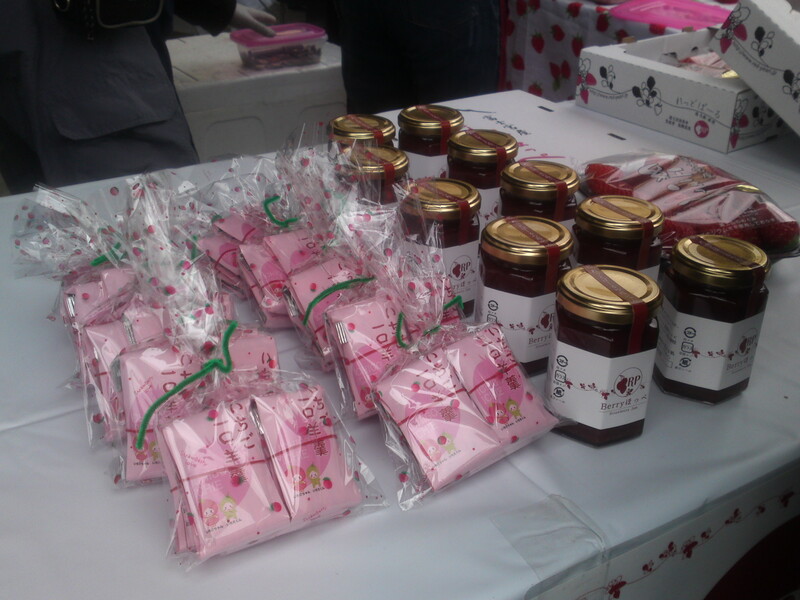 Many local producers were selling their products! 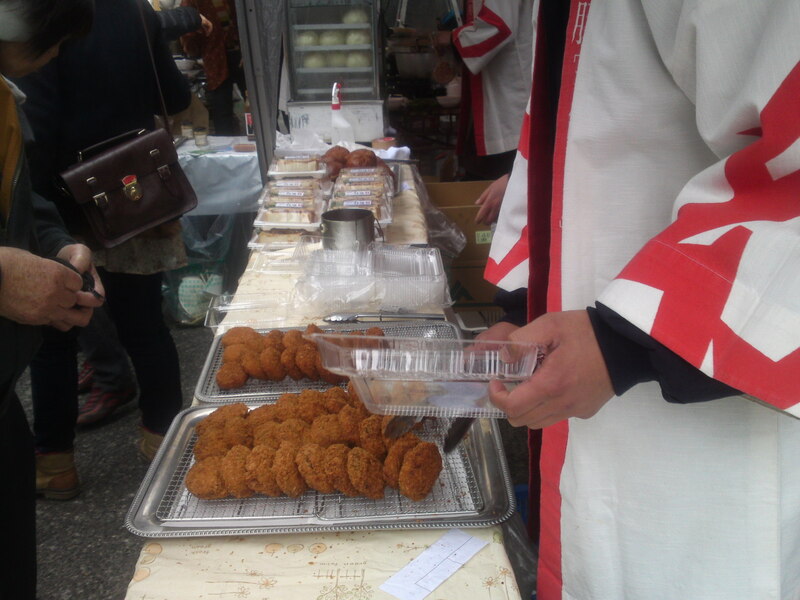 But the cold weather required plenty of hot food: Delicious croquettes by Sanoman Co.! It certainly brought smiles on many faces! 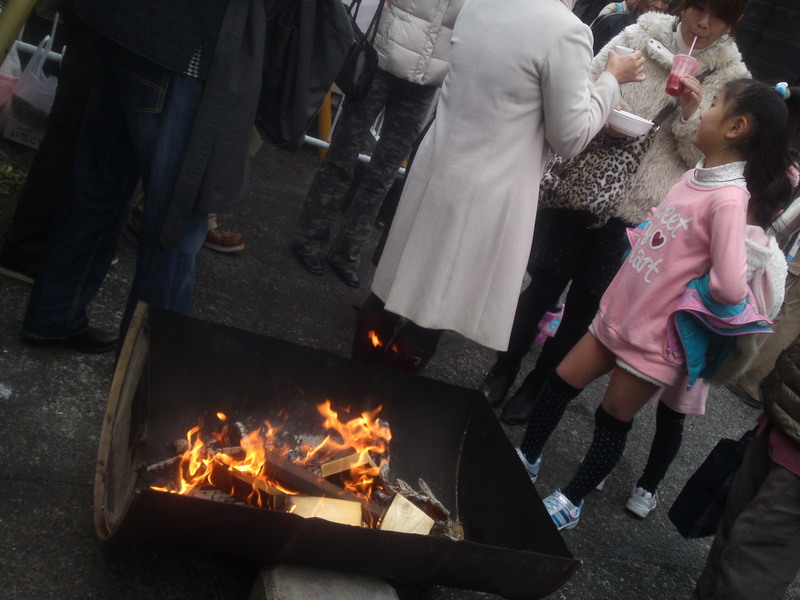 Even so, quite a few visitors gathered around one of the many fires! Another method to keep away from the cold was to queue for more free sake! What with visitors coming from far away the brewery staff was busy selling their nectars! It was a battle to reach the bottles! 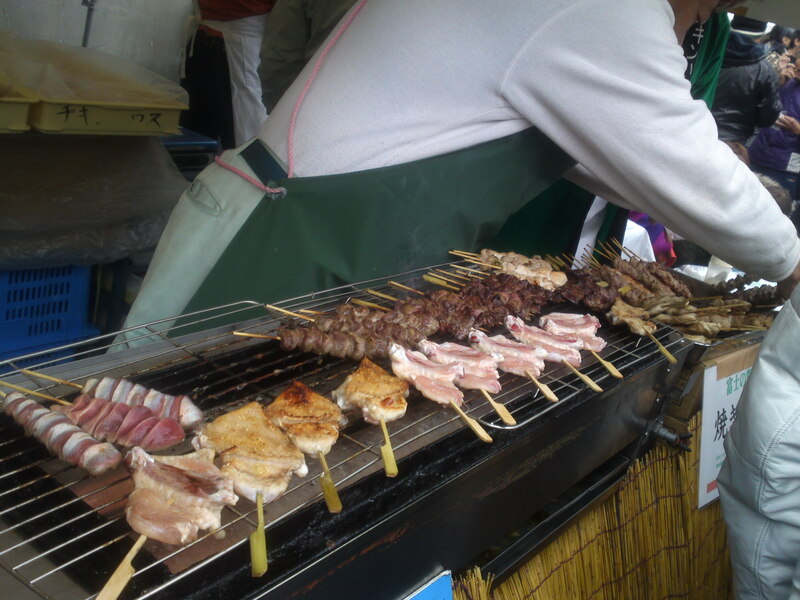 Sake is fine but one can’t drink on an empty stomach, so it was back to the food stands! Mind you, there was plenty of green tea on offer! 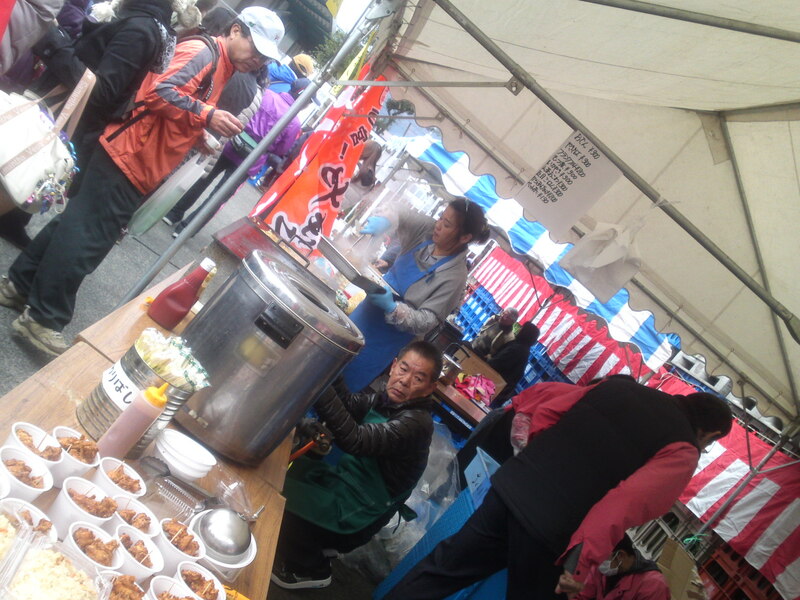 Tonjiru soup and karaage chicken! 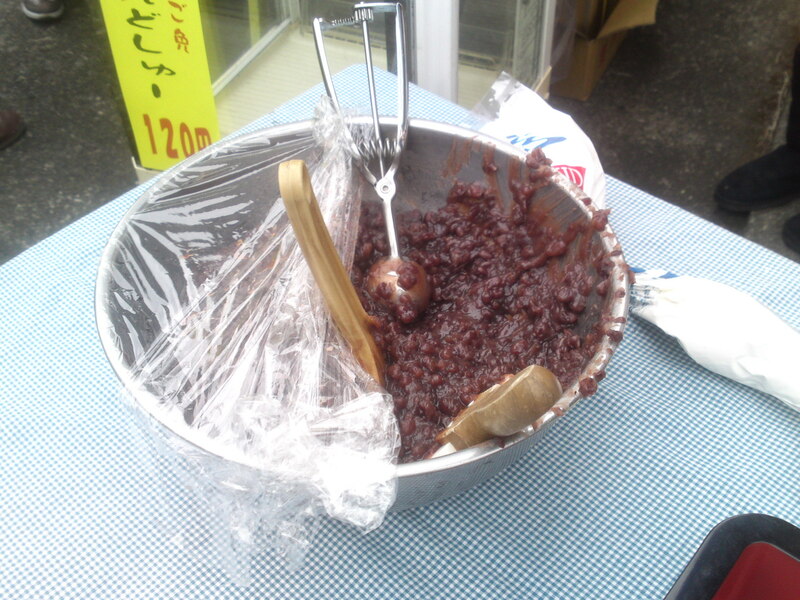 Now, what is this freshly made anko/sweetmeats for? 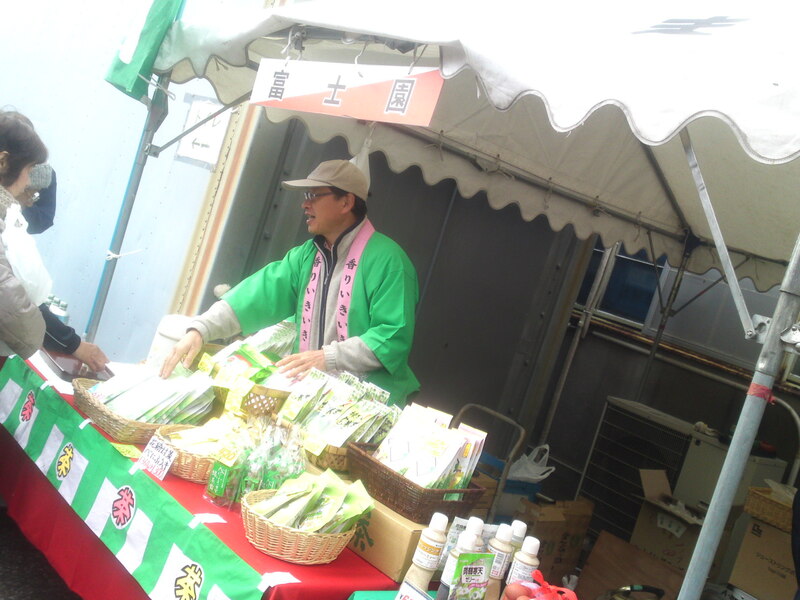 Apart of Fuji-Takasago Brewery and Sanoman Delicatessen, there were two more stars present! 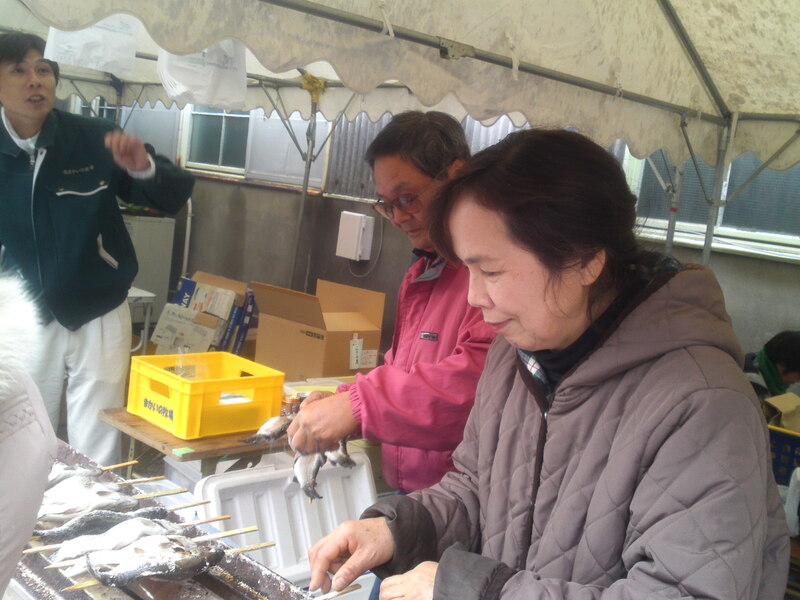 First Kunugi Rainbow Trout Farm from Fujinomiya City! It was non-stop work for the Kunugis! Couldn’t wait for these beauties to be ready! 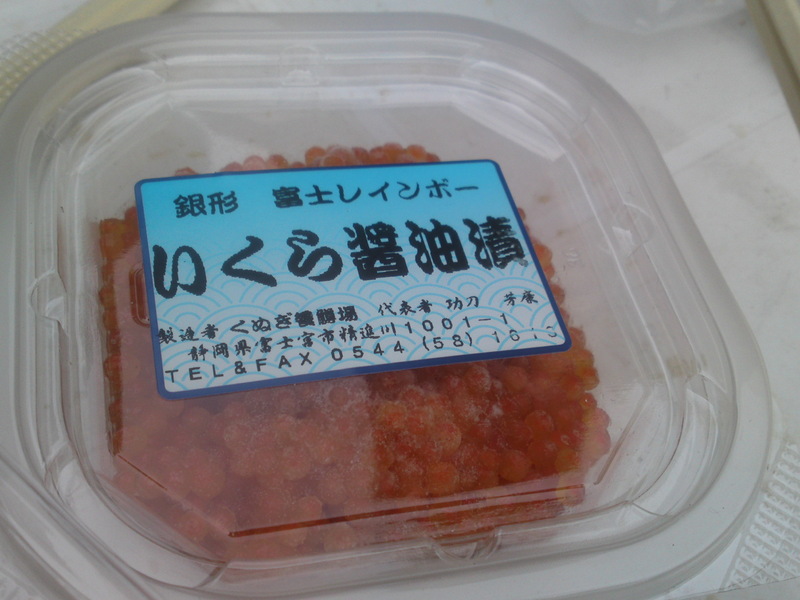 A very rare treat: Red caviar from the land, Rainbow trout Roe! Another rare treat: canned raibow Trout! 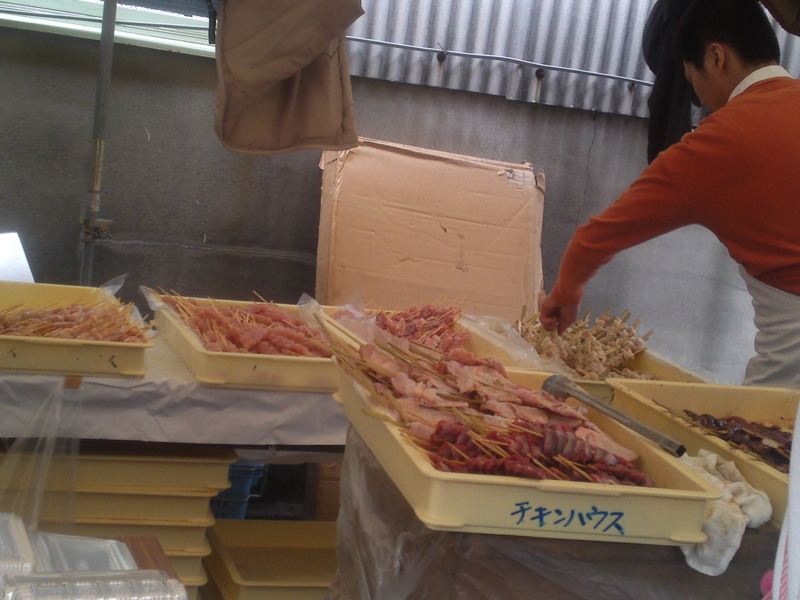 The other star was yakitori by Aoki Chicken Farm in Fuji City! They certainly needed a lot to satisfy the enormous demand! I can guarantee you they were worth the wait! I’ll have to come earlier next year! 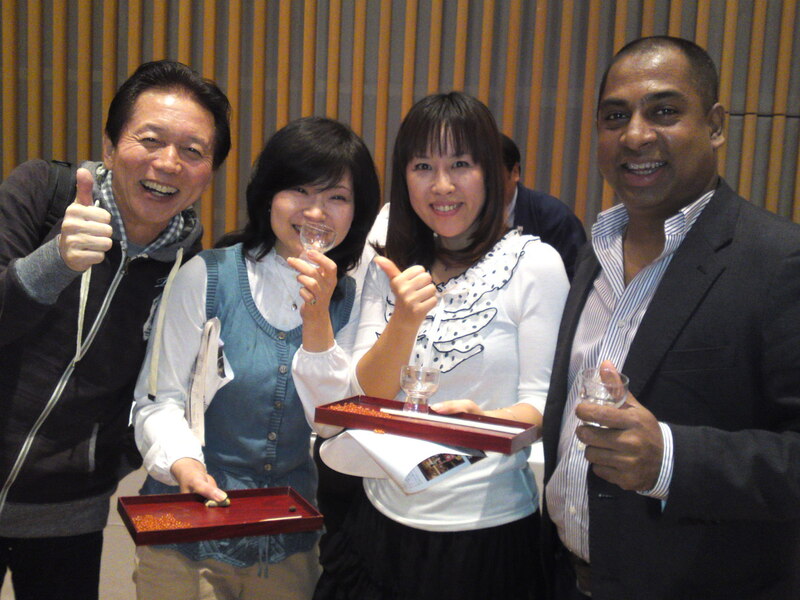 December and January are very productive months of the year at sake breweries! 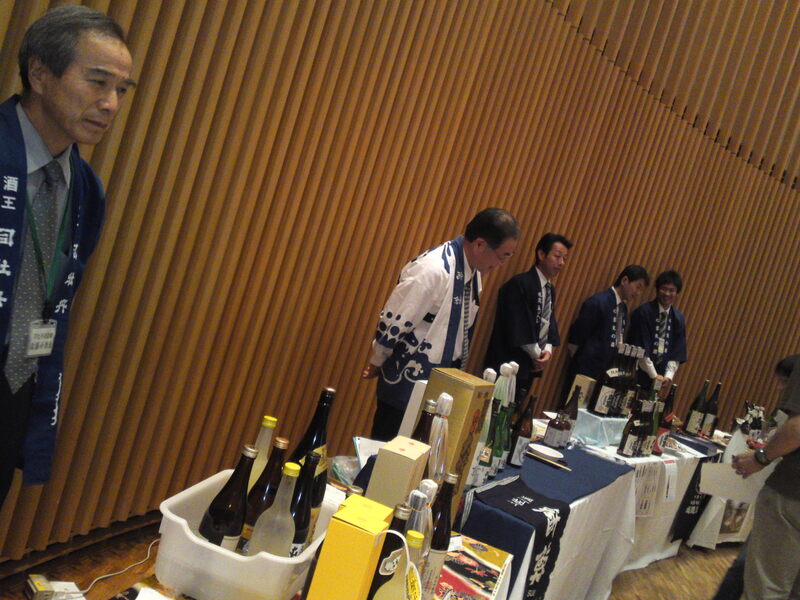 Most of the sake put out then are “shinshu/New Sake” and “Gentei shu/limited edition sake”. It is a great time for experimenting and looking for new flavors! 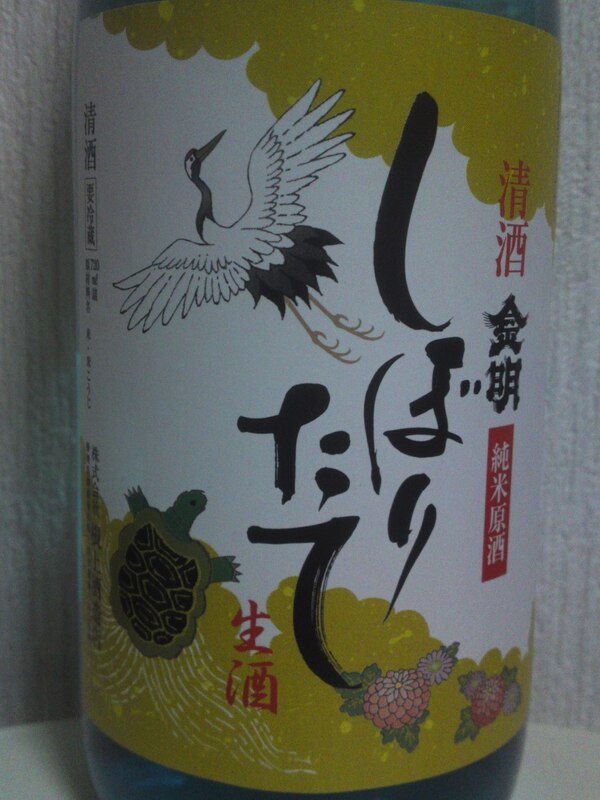 This particular brew concocted by Kansawagawa Brewery in Yui, Shimizu Ku, Shizuoka City is a limited edition. 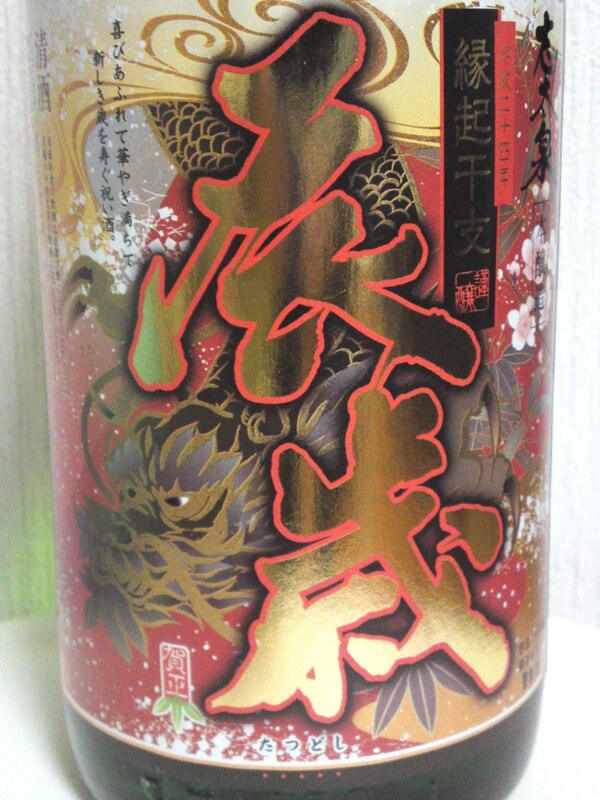 They accordingly came up with the name “Shizuoka Aoi Premium” to differentiate it from other brews. 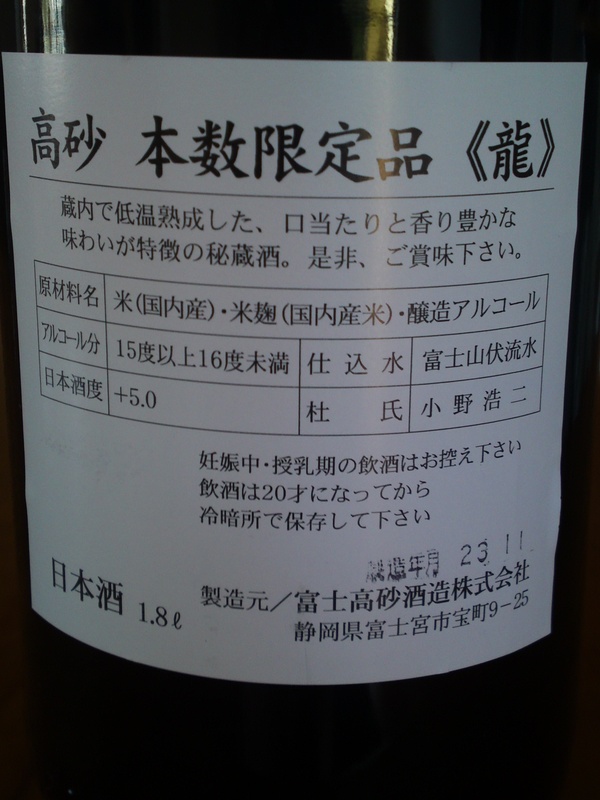 It is a daiginjo of extravagant proportions when you consider the rice has been milled down to as little as 35%. 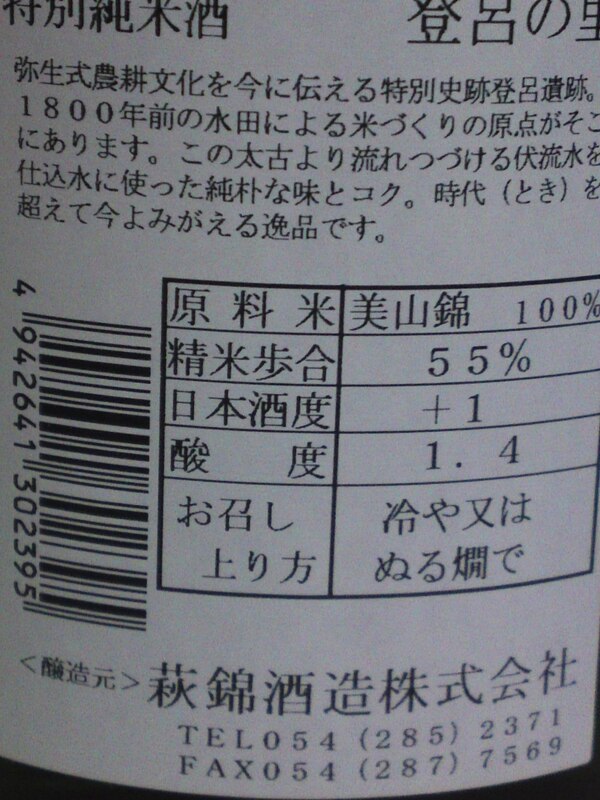 The fact it is also a “Nama/unpasteurised” sake means there was little manipulation! Aroma: Fruity: dry bananas, pears, apples. Taste: Dry fruity attack backed up by pleasant alcohol. Lingers only for a little while warming up the palate and disappearing on a sweetish impression and then back on a dry note. Complex. Banana, apples. Grows even drier on second sip and even drier again with food. Some oranges, dry nuts and faint coffee beans peeking out later. 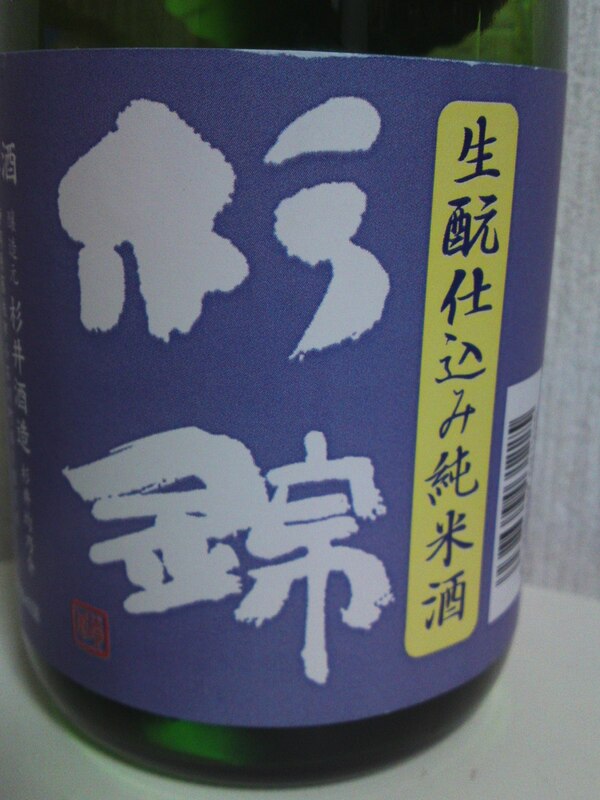 Intriguing and aggressive sake, unusual by Shizuoka standards. 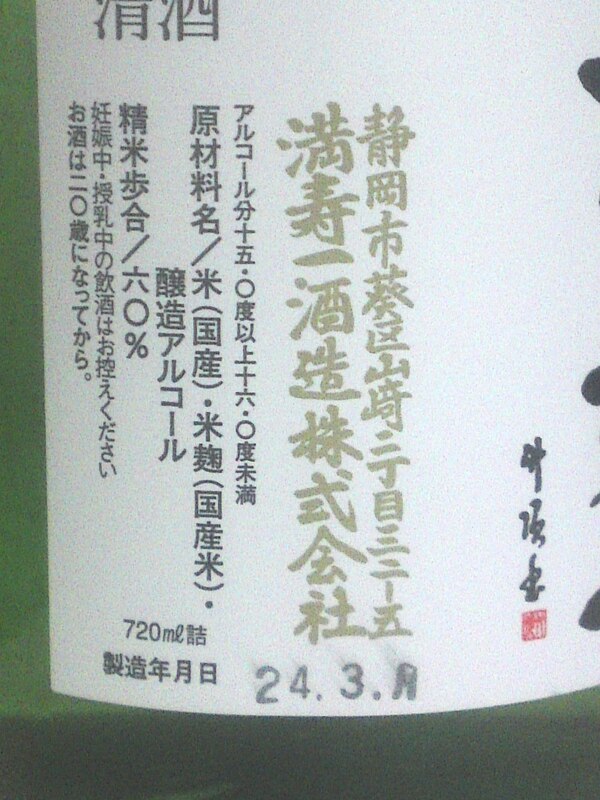 A “provocative untamed sake”, or a “one-night only lover”? What I like about Sugii Brewery in Fujieda City is that they are never short of words when it comes to explaining the manufacture and the ingredients of their nectars! “Nama” means that it was not pasteurized. “Nakatori” means that the sake was collected some time after the beginning of the pressing and only until some time before the end, meaning basically the best part of the pressed sake. 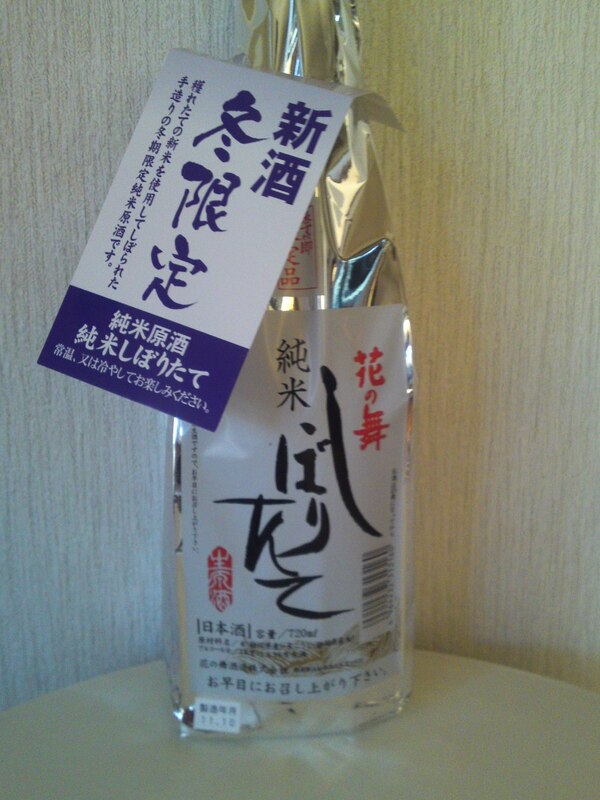 Finally “genshu” means that this is original sake with no later addition of pure water. 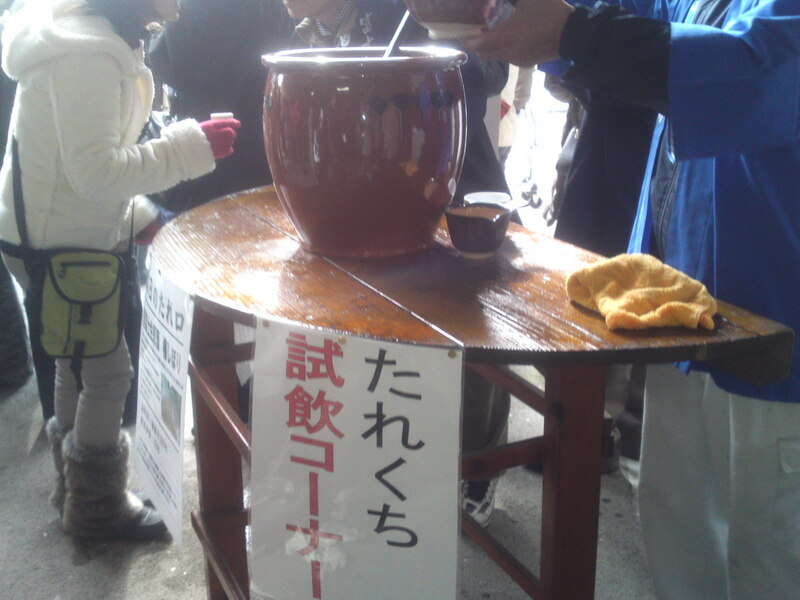 “Nama moto” means that the sake was made according to old traditions with natural lactic acid. Aroma: Sharpish, fruity and complex. Pears, oranges, dark chocolate and banana. 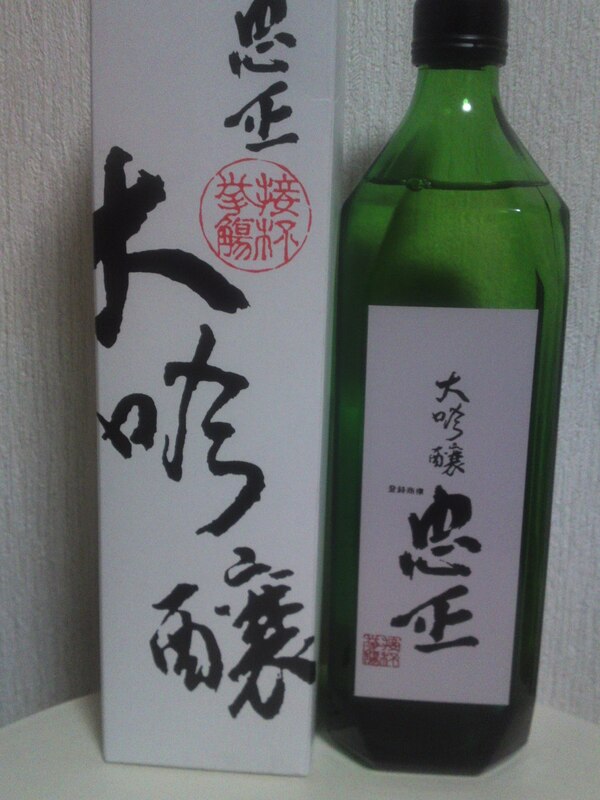 Taste: Dryish, fruity and complex attack backed up with a pleasant combination of alcohol and junmai petillant. At first reveals oranges and a faint note of dark chocolate while warming up the palate. Lingers on for a while before disappearing with dry mandarines. Coffee beans peek out later in further sips with a junmai petillant comeback along with notes of greens and dry almonds. 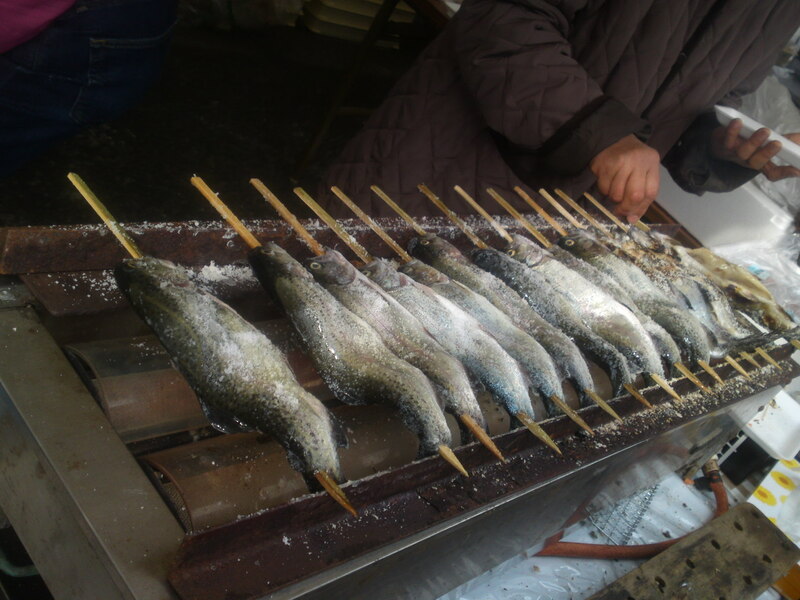 Varies little with food. 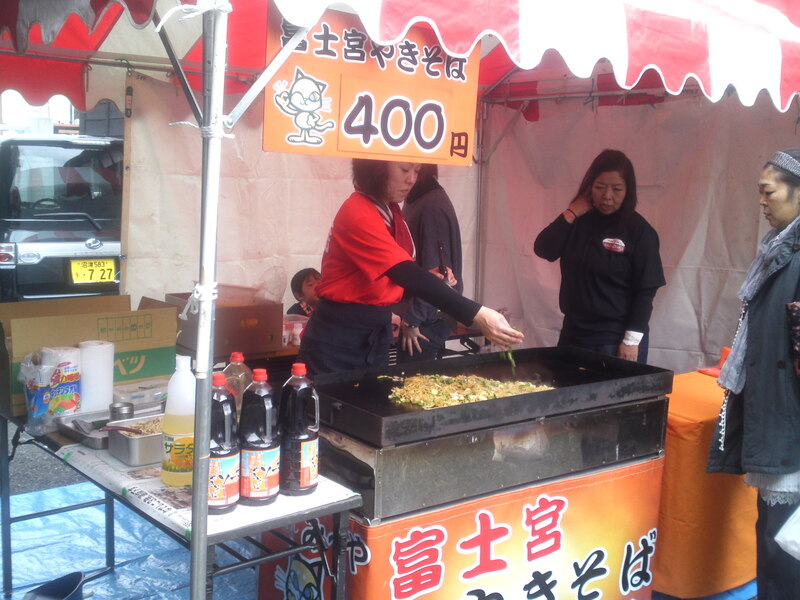 Marries well with izakaya-style or European stew-like food. 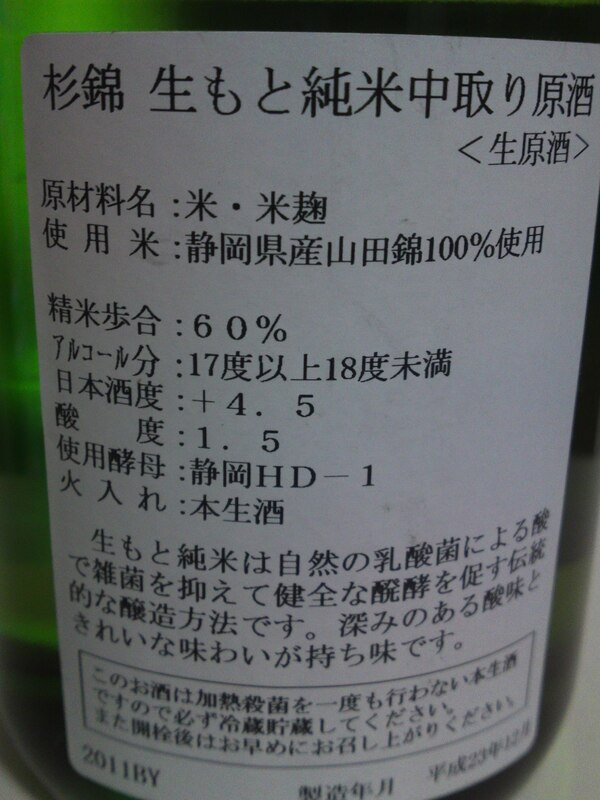 Overall: Unusual by Shizuoka standards, but eminently drinkable on its own. Marries well with food. Does not linger that long, thus inviting you to the next glass. A sake perfect for hot winter food! Its deep and pleasant acidity combining with complex fruitiness define its character. 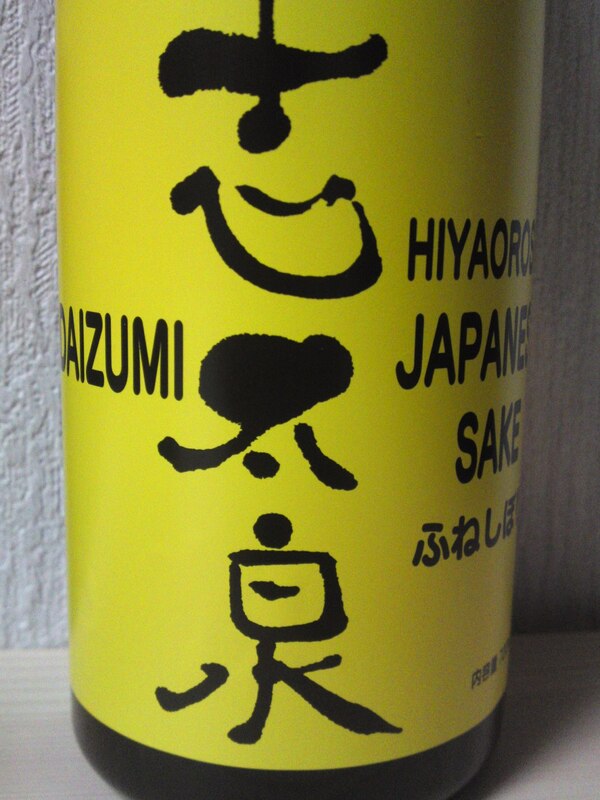 A sake for people who love the izakaya gastronomy! 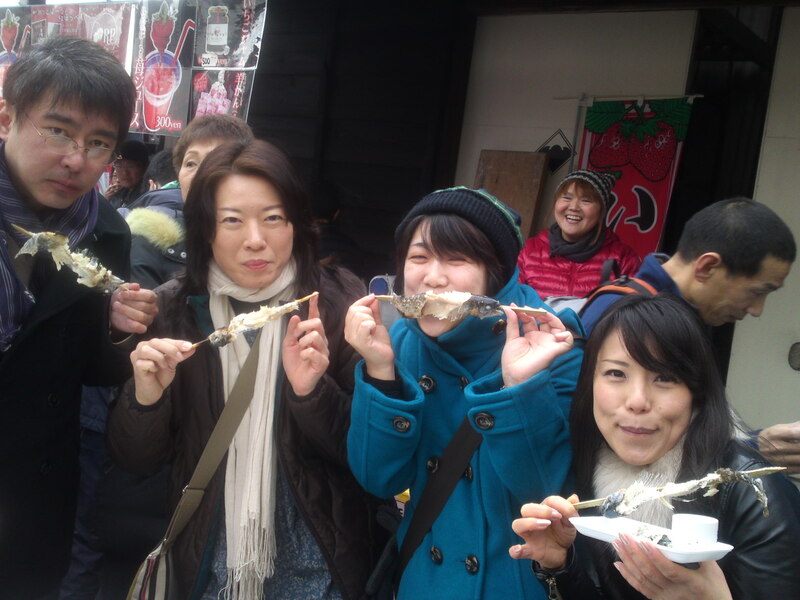 2012, or more precisely the 24th Year of the Heisei Era, will come under the Sign of the Dragon/Tatsu/龍! I’ve always had a special fondness for dragons to the point of using them for my e-mail addresses and passwords (part of)! 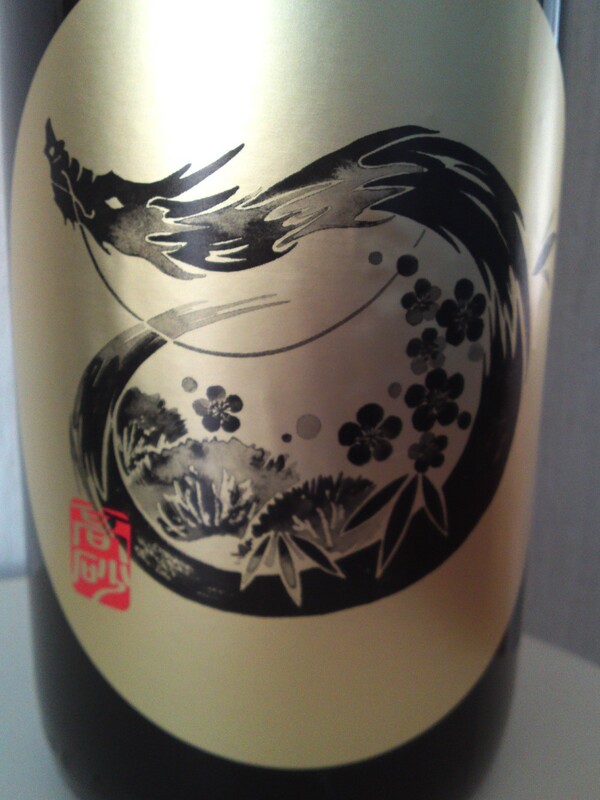 Shidaizumi Brewery has a tradition of coming with a honjozo every year with a splendid label for collectors! Aroma: Strong, complex and fruity. Banana, dark chocolate, pears. Taste: Drier attack than expected, very fruity and complex. Lingers on for a short while with a dry note backed by pleasant alcohol. Fruity and dry. Complex. Oranges, banana, dark chocolate, macadamia nuts. Finishes on a dry note with strong hints of nuts and a faint trace of coffee beans. Shows more facets than expected, especially oranges and coffee beans fighting for supremacy as taste lingers away. Overall: A sake obviously conceived to accompany and enhance food, although its high (extravagant) quality makes it eminently drinkable on its own. 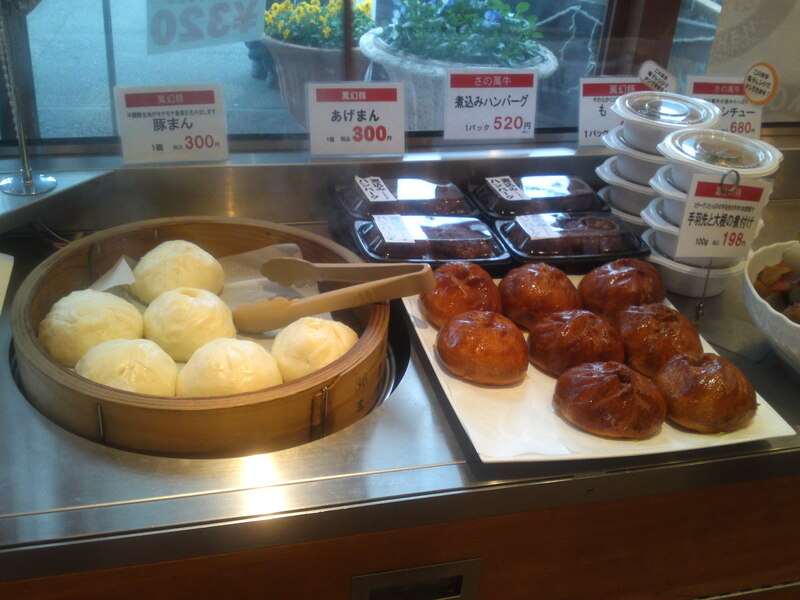 Can be appreciated at room temperature and nurukan/lukewarm. Tends to surprise with many unexpected facets appearing out of nowhere. 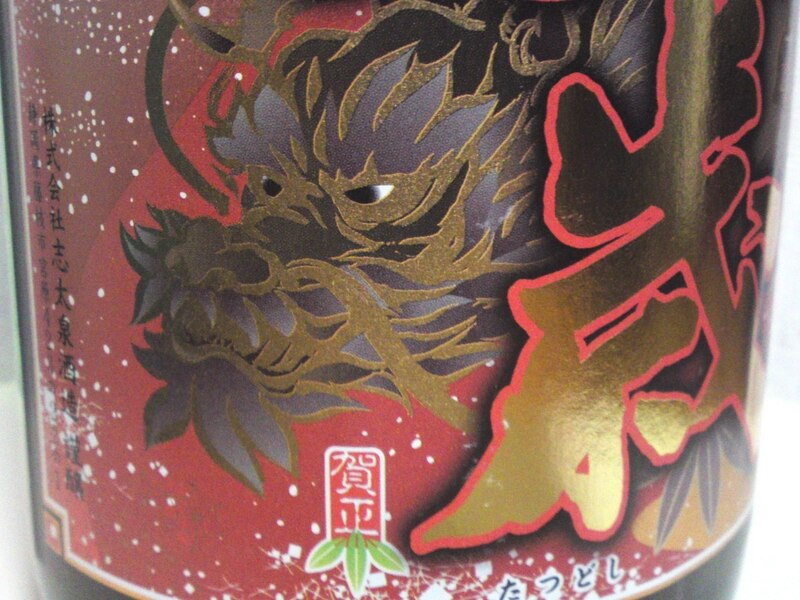 The New Year is around the corner, and as next year is the Year of the Dragon, many breweries put out various limited brews with a Dragon label! 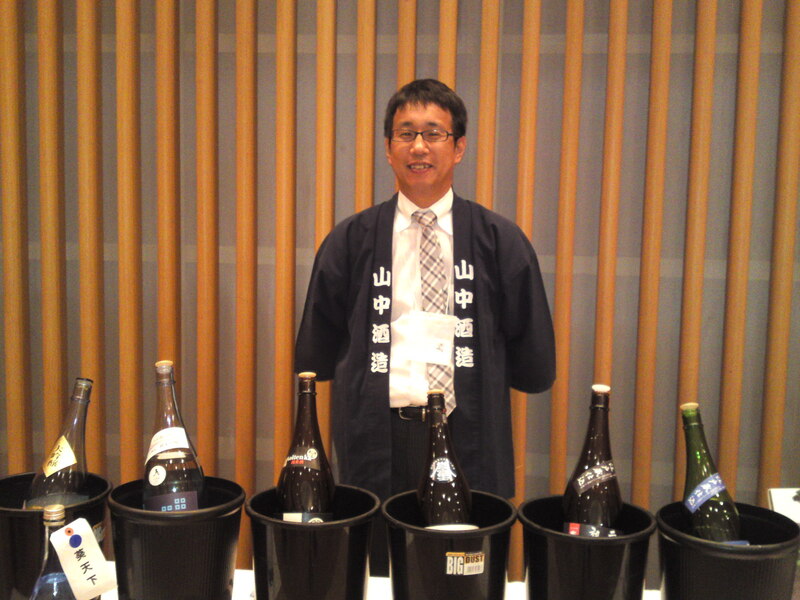 Fuji-Takasago Brewery in Fujinomiya City came up with a limited Futsushu/regular brew for the occasion! Be assured that the label will be carefully stored away! Aroma: Strong and fruity. Dryish. Coffee beans, vanilla. Taste: Very powerful and fruity attack backed by pleasant alcohol warming up back of the palate. Coffee beans, dark chocolate, vanilla, apricots. Fairly quickly disappears on a very dry note. Varies little with food but gets drier with some oranges joining in with dry coffee beans. Coffee beans repeatedly make a strong comeback with every sip. 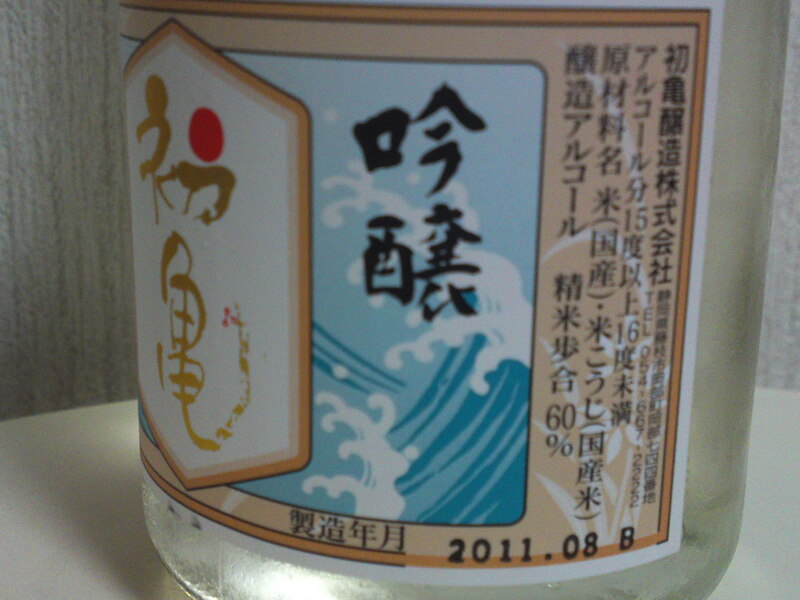 Overall: A sake obviously designed for food but eminently drinkable on its own. The fruitiness tends to conceal the dryness at first. Can be appreciated in any ways: chilled, room temperature or lukewarm. 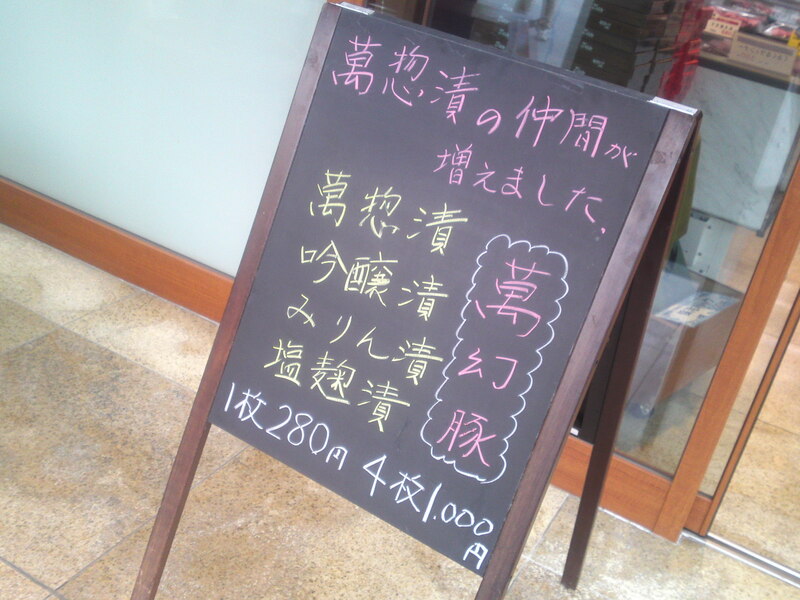 Considering it is only a futsushu, one might overreact and talk of extravagance for such a cheap price! 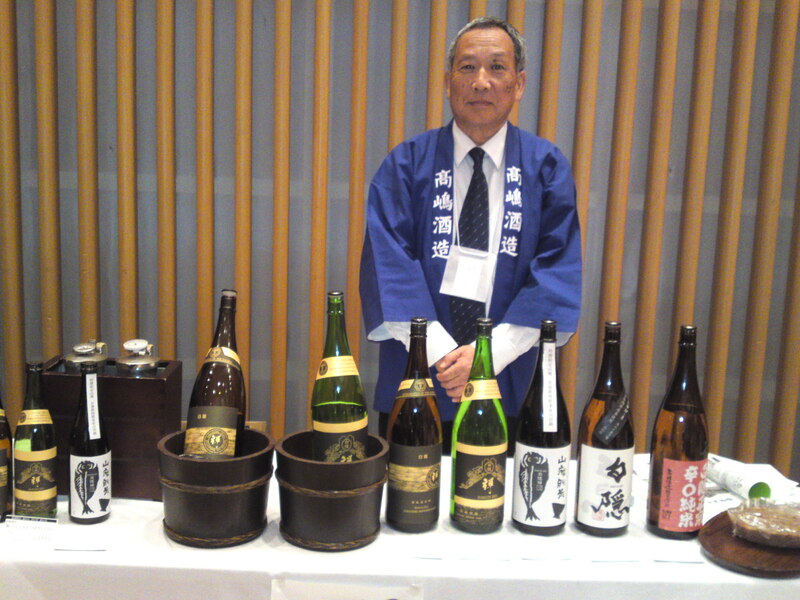 The labels of Sake Breweries make for a good support for advertising cultural assets among others to the rest of the world. 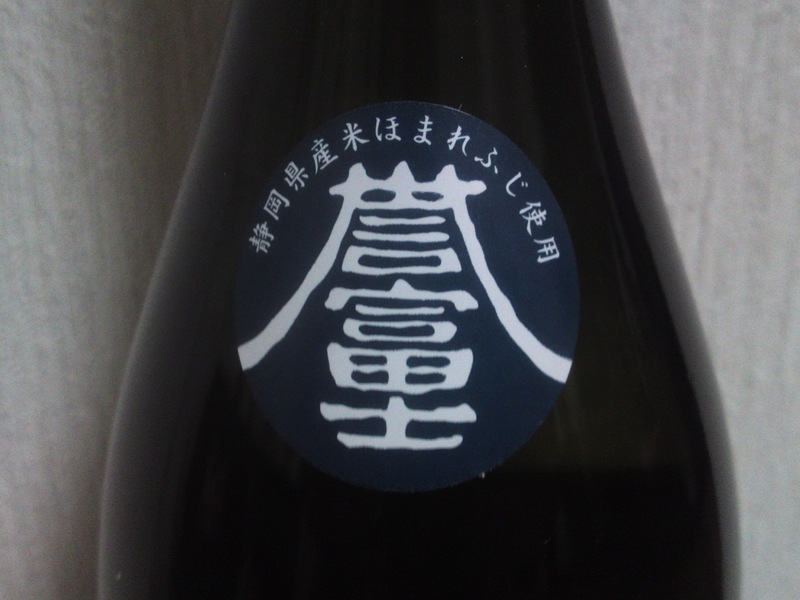 Haginishiki Brewery in Shizuoka City has long been producing a fine sake under the name of Toro no Sato/登呂の里:Toro Village to commemorate the Ruins of Toro. The site of a village dating back to the late Yayoi Period (about 2,000 yeras ago) was unearthed on the 11th of July 1943 in the middle of Shizuoka City. It is registered as a National Historic Monument and is open to the public as well as a Museum. Taste: Very dry attack backed by Junmai petillant. Complex and fruity: Coffee beans, banana, dry nuts. Starts and ends up very dry with pleasant alcohol. Turns even drier with food with strong hints of coffee beans and dark chocolate competing with very dry banana and greens. 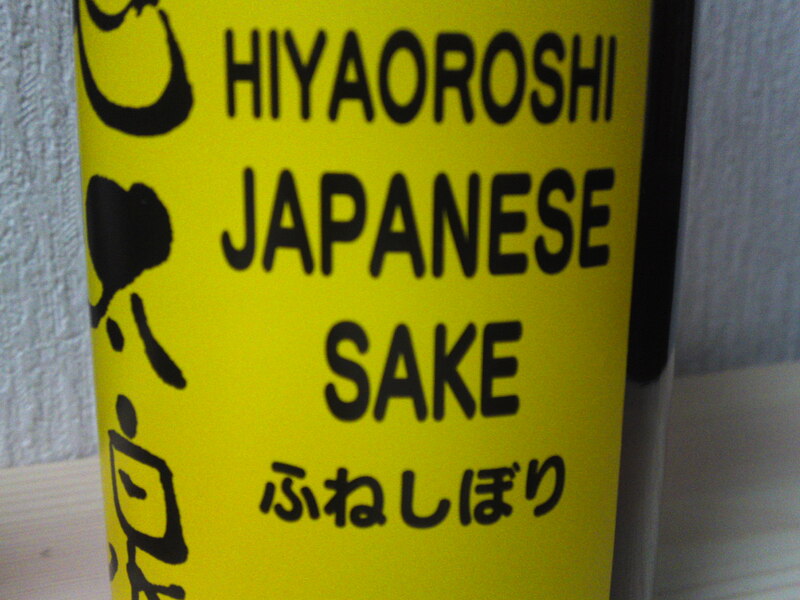 Overall: A sake obviously devised for food that can be drunk lightly chilled, at room temperature or lukewarm. More complex and drier than expected. 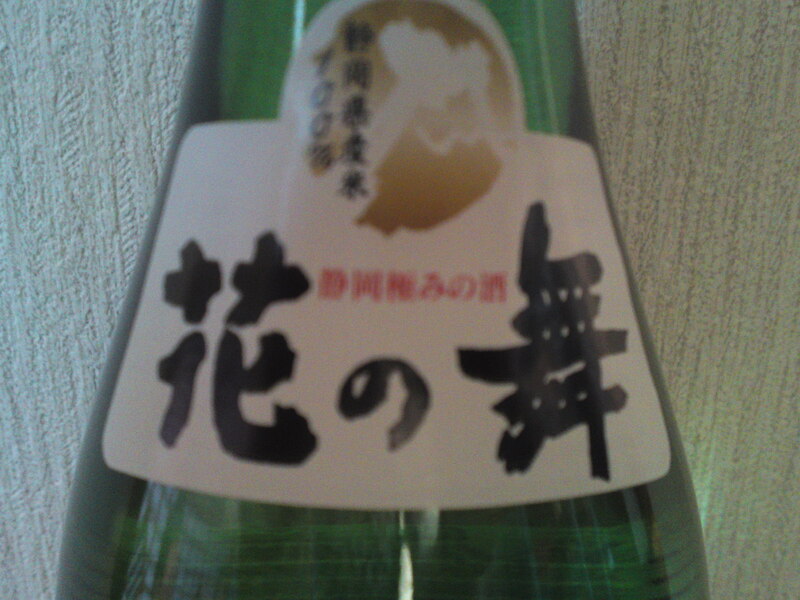 Its dryness makes it a good sake for any food, especially izakaya fare. Very solid and dependable. 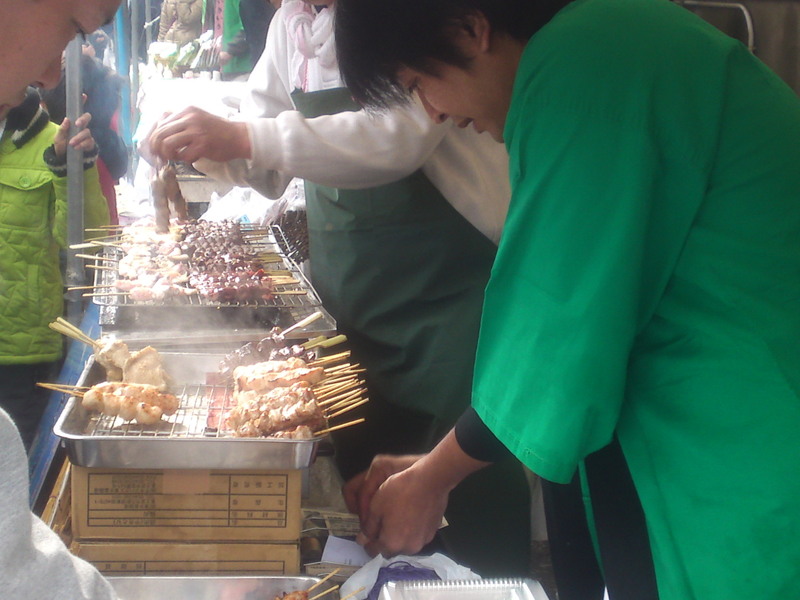 No wonder we see it often in Shizuoka Izakayas! Hana no Mai in Hamamatsu City (formerly Hamakita City) is the largest Sake Brewery In Shizuoka Prefecture although still a medium-sized one by Japanese standards. They do export quite a lot to the US. Every year in Autumn when they start putting out new sake they come up with a couple of gentei (limited editions) to celebrate the beginning of the brewing! On top of local water, most of their sake are made entirely with Shizuoka Prefecture ingredients, that is, their own sake rice and yeasts! Aroma: Strong and fruity: pineapple, pears. Alcohol. 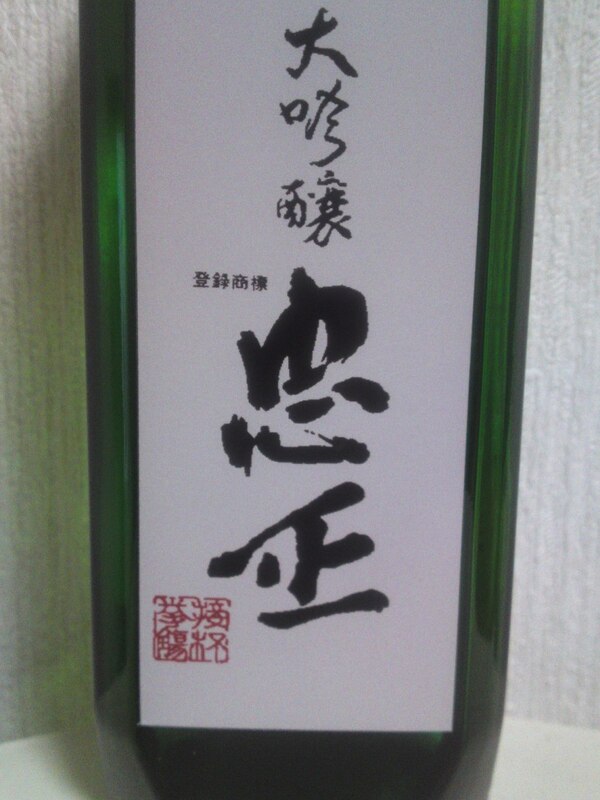 Taste: Strong attack backed up with junmai petillant and pleasant alcohol. Very fruity and slightly dry. 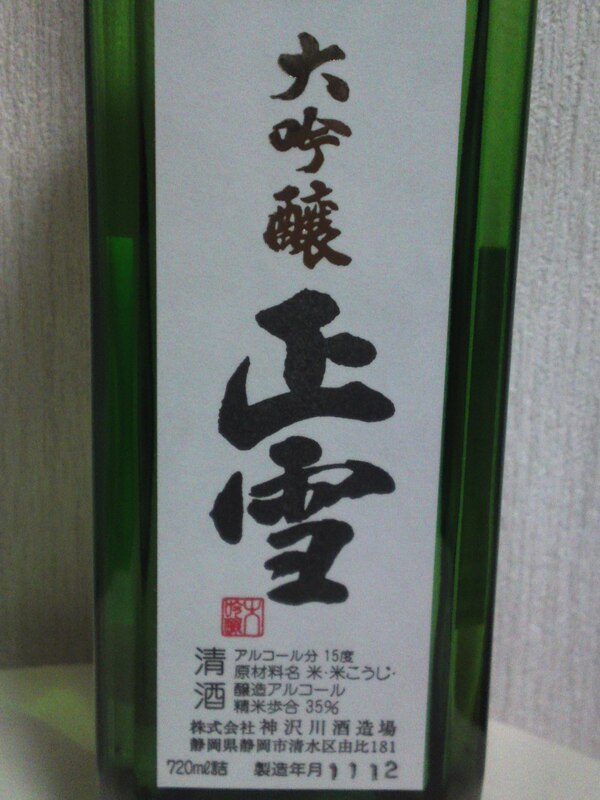 Pleasant and easy to drink in spite of its high alcohol contents. Disappears on a dry note with more chestnuts and mandarines. Changes little with food, although gets drier with dry mandarines and pears. Dry mandarines tend to take over after a cup or two. 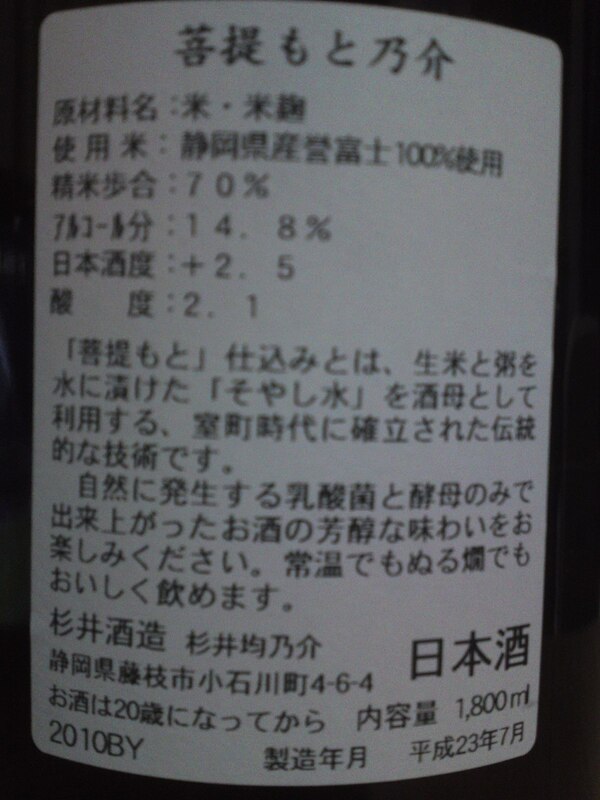 Overall: In spite of the high alcohol contents it is a very pleasant and complex sake. The same high alcohol contents make it fit to drink with food. 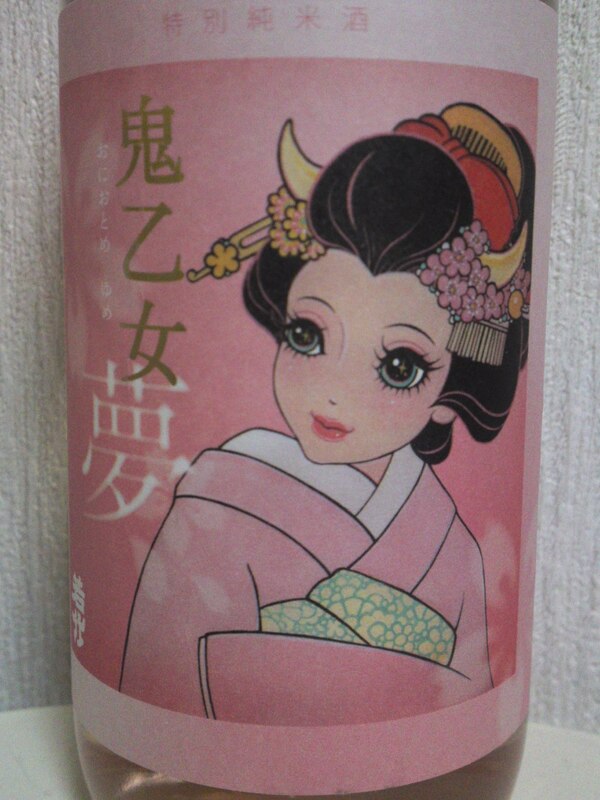 A slightly unusual sake for Hana No Mai Brewery which tends to concoct brews for a younger generation, especially ladies. That could explain its limited edition status! Japanese breweries all over Japan sell their brews in small bottles containing only 300ml/cc of their sake, which makes it very easy to transport, and although ml for ml it is more expensive it means you do not have to spend too much money at once and at the same time allows you to finish the bottle quickly, especially if you drink it on your own! Moreover, it helps you taste more nectasr of the same brewery. The only problem is that breweries will put out only 3 or 4 varieties in such small bottles! The labels of Hatsukame Brewery in Okabe (recently part of Fujieda City) are popular with collectors as their designs are simple, retro and artistic! 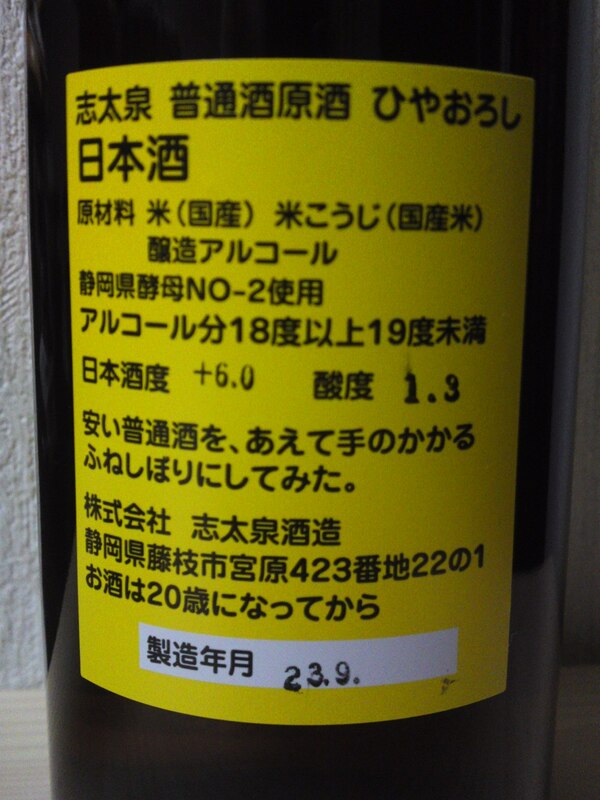 This particular brand being “nama/生/unpasteurised means you have to drink it up quickly. Therefore this small bottle is most practical! Starts sweetish to quickly end up very dry. Fruity: oranges, almonds. Banana appears later with very dry oranges. Complex. Changes so quickly inside palate. Very dry coffee beans pick out later backed up by more dry almonds. 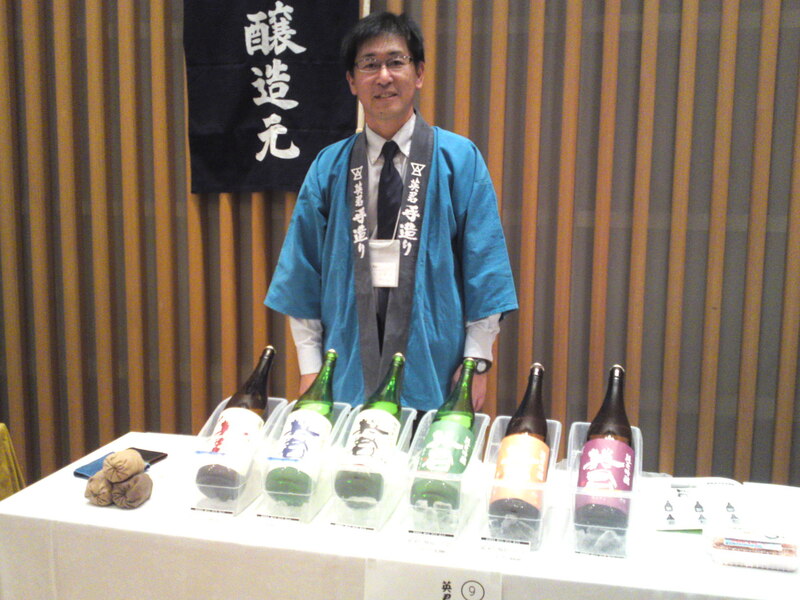 Overall: A very complex sake with ever-changing facets. The fact it is a “nama” does come very much in play. Beautiful sake on its own although obviously conceived to marry well with any food. Could be happily used with strong food with cheese coming to mind! 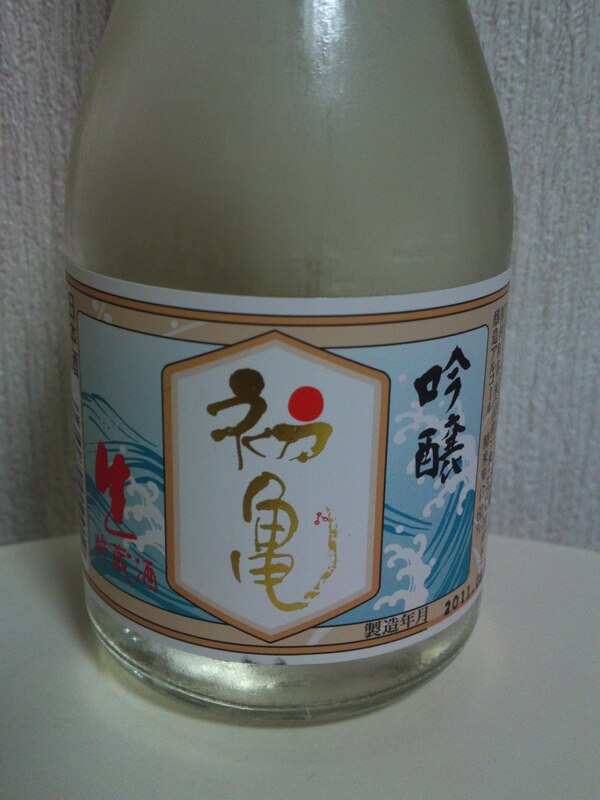 Senju Brewery in Iwata City produces what could be termed “maboroshi sake”, “hidden sake”, as it is difficult to obtain away from Iwata City. They produce superlative sake and shochu, and what’s more they have recently joined a growing number of breweries making sake with rice cultivated without any agrochemical agents! 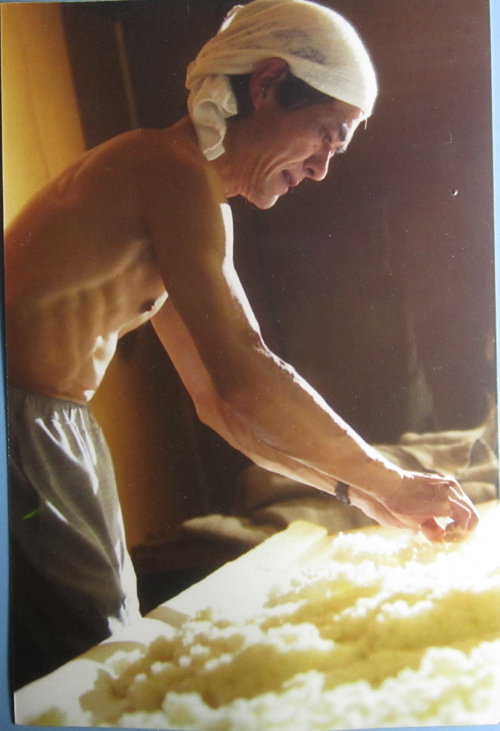 Creating junmai ginjyo with such a rice is a proof of courage and extravagant quality! Interestingly enough, the name “Senju” almost does not appear on the label! You will find it on the cap! Aroma: Discreet, dryish and fruity. 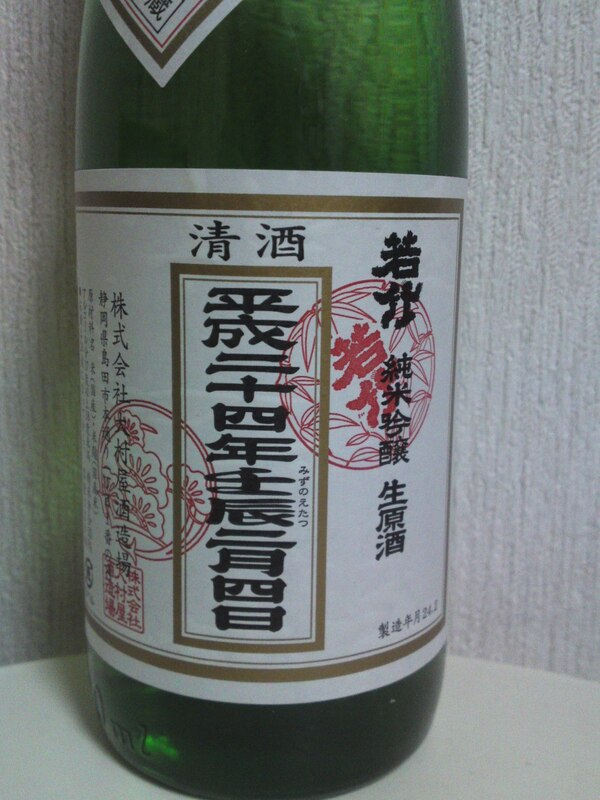 Taste: Dryish and fruity attack backed up by a little junmai petillant. Greens, dry apples, coffee beans, notes of mandarines and liquorice. Disappears quickly on a sweetish note. Turns slightly drier with food with more greens appearing. Overall: Definitely a sake conceived for tasting although it beautifully marries with food thanks to its pronounced dryness. Feminine in approach, a sake greatly appreciated for its own sake although I particularly enjoyed it with deep-fried vegetables! Tends to disappear quickly, making it so easy to drink! 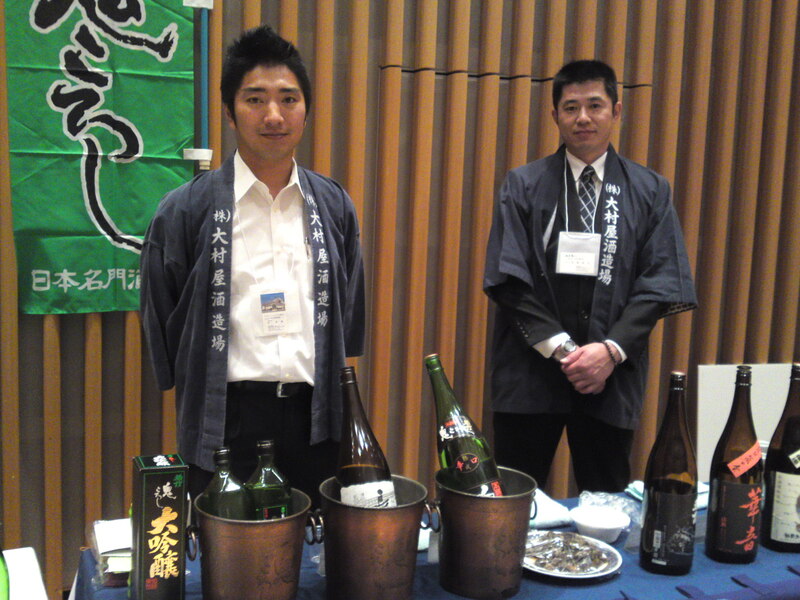 7th Sake Festival-Let’s Meet the Brewers in Shizuoka City! Good sake knows no borders! 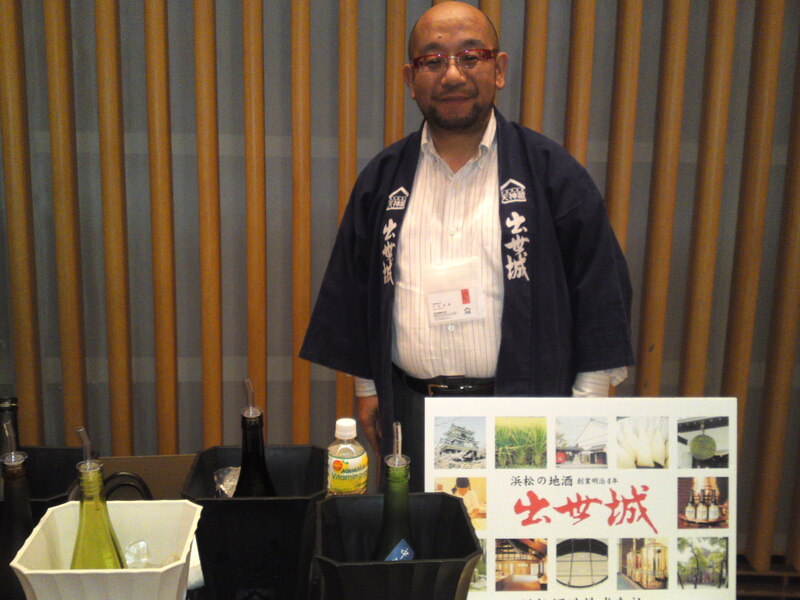 Among many very active events promoting sake and Shizuoka Sake in general the Meigara Tanhou Kura no Kai/Dai Nanakai Kuramoto to Kataru Kai/ Sake Matsuri/銘柄探訪　蔵の会　第７回　蔵元と語る会　２０１１　酒祭/Discover the Brands Breweries Association/7th Let’s Speak with Brewers Association/2011/ Sake Festival is drawing increasing attention. 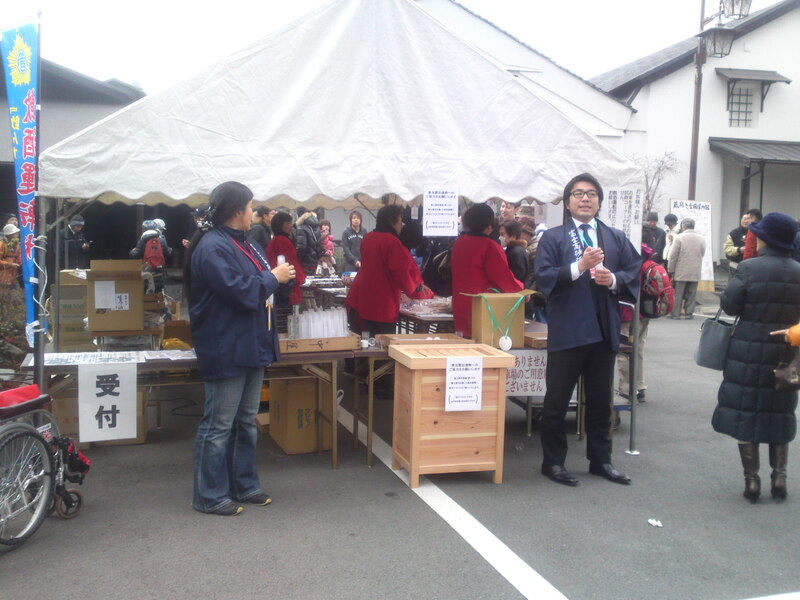 Its 7th edition was held on the 3rd of November In Granship, Shizuoka City and gathered no less than 250 guests (for a demand double of that number!) and 14 brewers from Shizuoka Prefecture and 10 brewers from Akita, Yamagata, Fukushima, Ishikawa, Gifu, Okayama, Hiroshima and Kochi Prefectures! 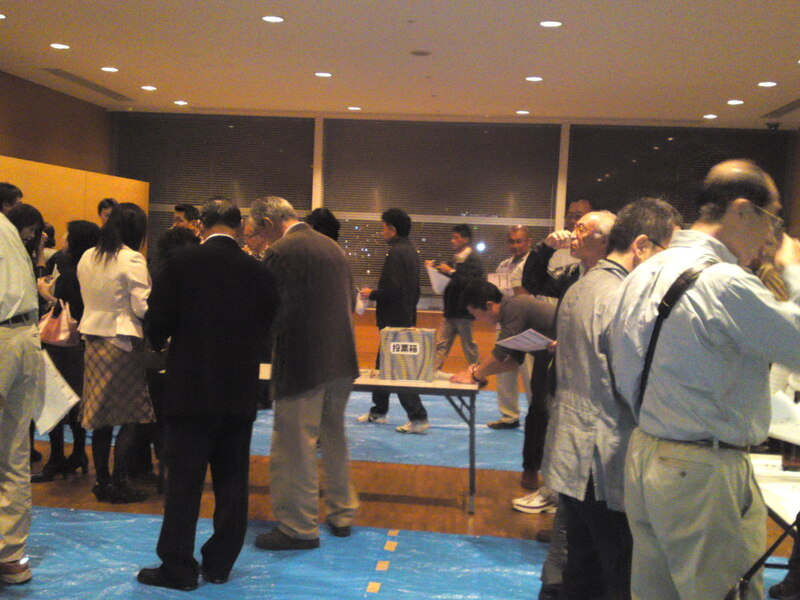 while others participated in earnest to the tasting competition! 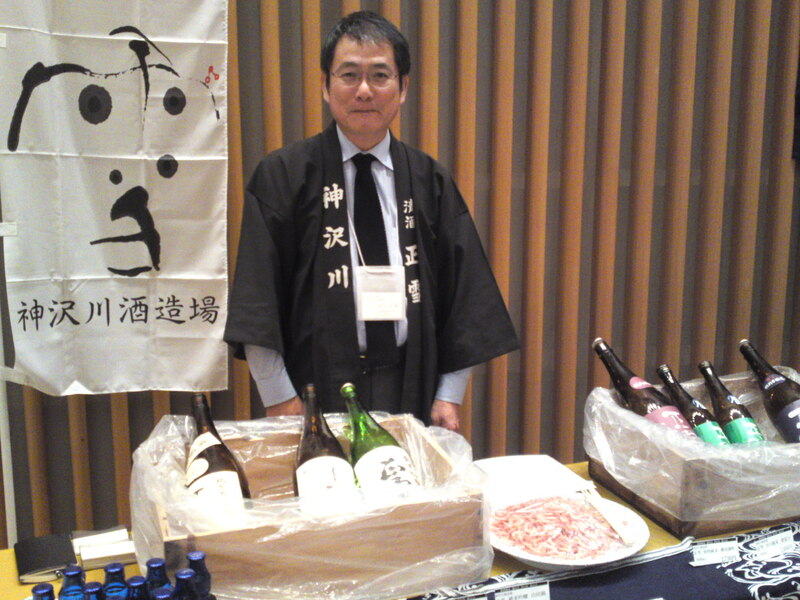 Mr. Doi, Chairman of the Shizuoka Sake Brewers Association and owner of Doi Brewery (Kaiun) in Kakegawa City! I barely had the time to greet and photograph the participating breweries! Yamanaka Brewery (Aoitenka) from kakegawa City! 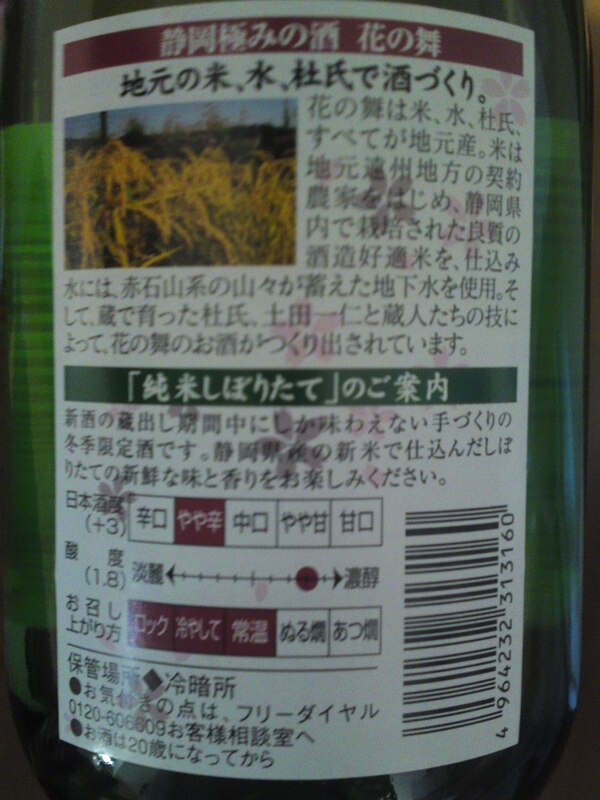 Morimoto Brewery (Sayogoromo) from Kikugawa Citry! 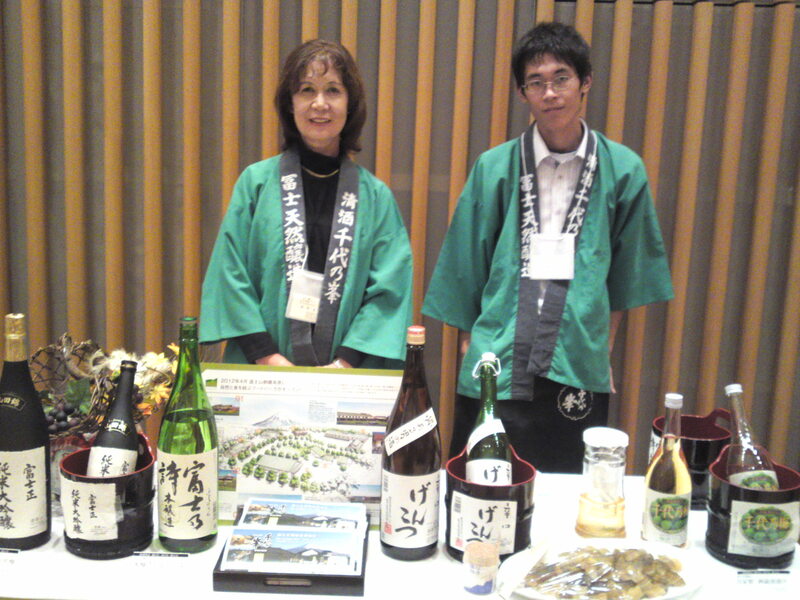 Oumuraya Brewery (Wakatake) from Shimada City! Suruga Brewery (Tenko) from Shizuoka City! Sanwa Brewery (Garyubai) from Shimizu Ku, Shizuoka City! 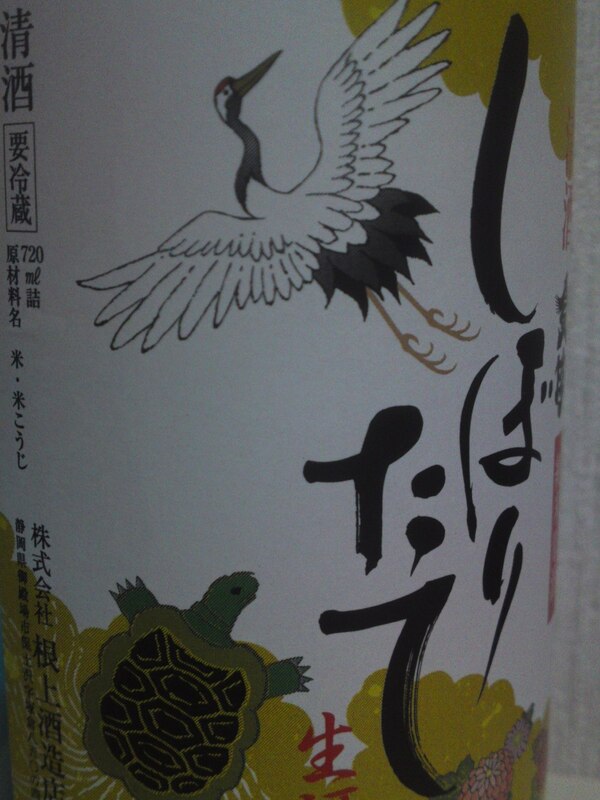 Kansawagawa Brewery (Shosetsu) from Yui, Shimizu Ku, Shizuoka City! 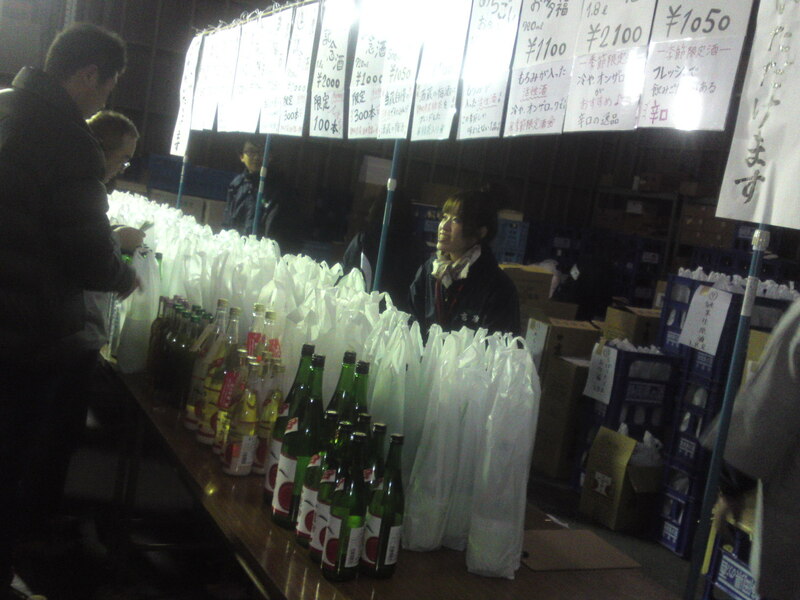 Eikun Brewery from Yui, Shimizu Ku, Shizuoka City! Fujinishiki Brewery from Fujinomiya City! 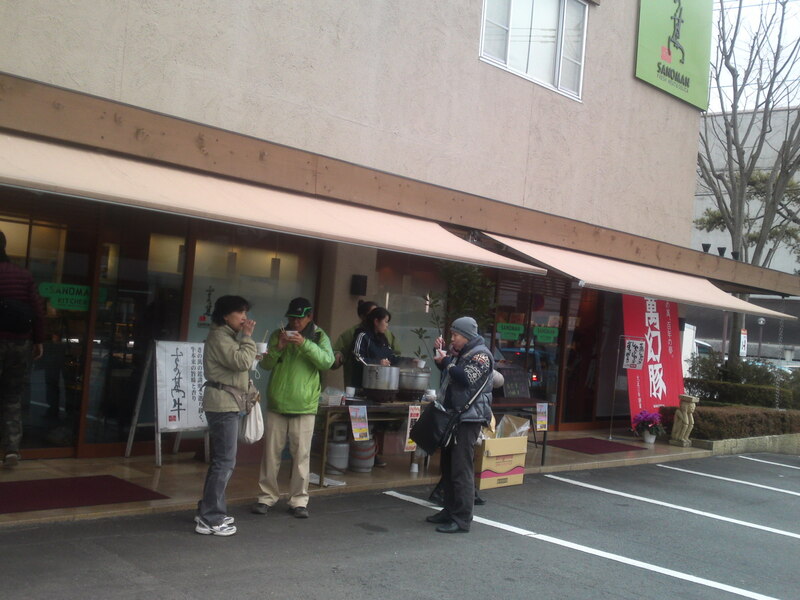 Fujimasa Brewery (Chiyonomine) from Fujinomiya City! Makino Brewery (Shiraito) from Fujinomiya City! Fuji-Takasago Brewery (Takasago) from Fujinomiya City! 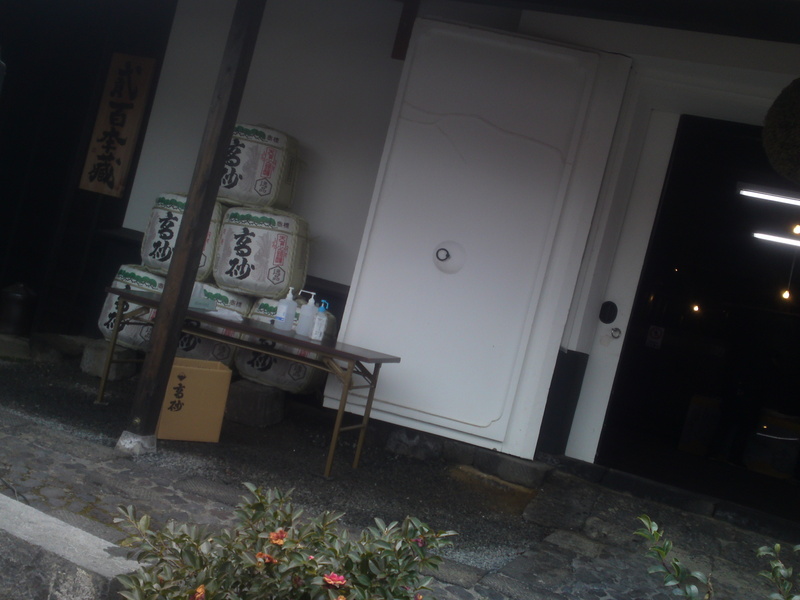 Takashima Brewery (Hakuin Masamune) from Numazu City! 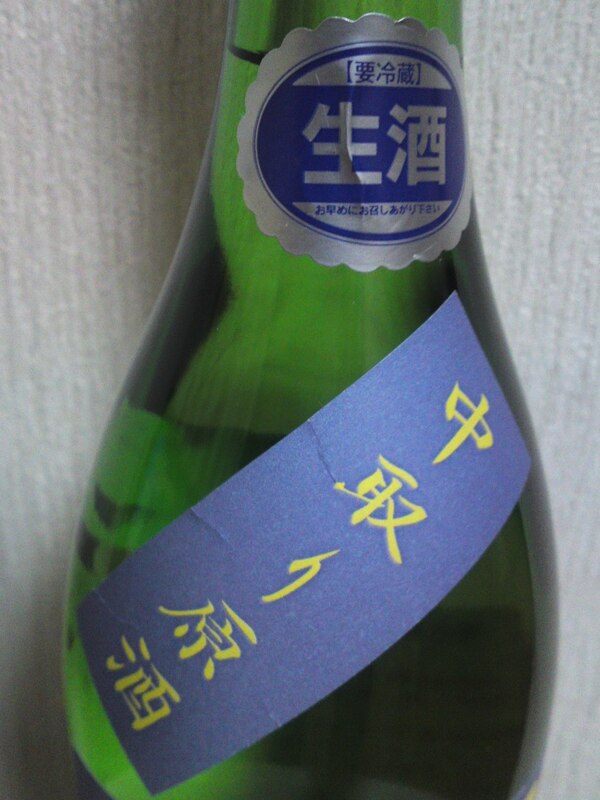 Hamamatsu-Tenjingura Brewery (Shusseijyo) from Hamamtsu City! 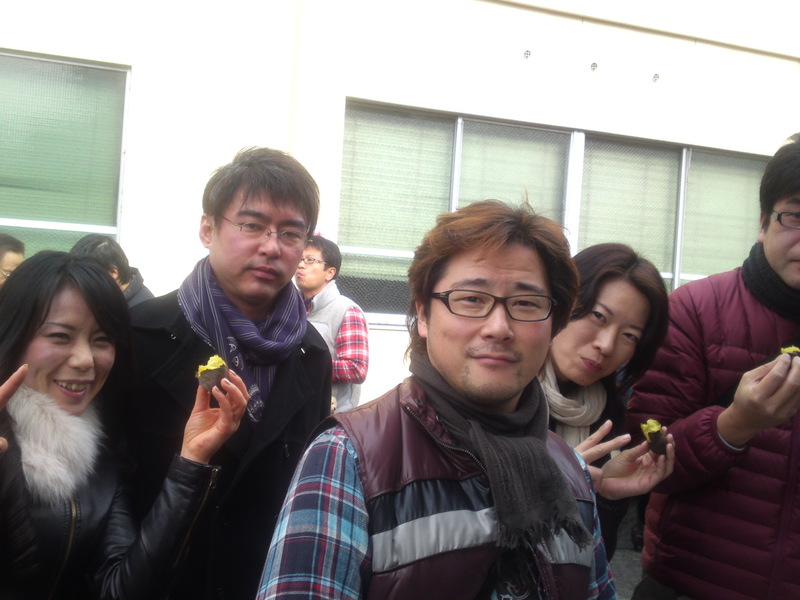 Guest brewers from other Prefectures! 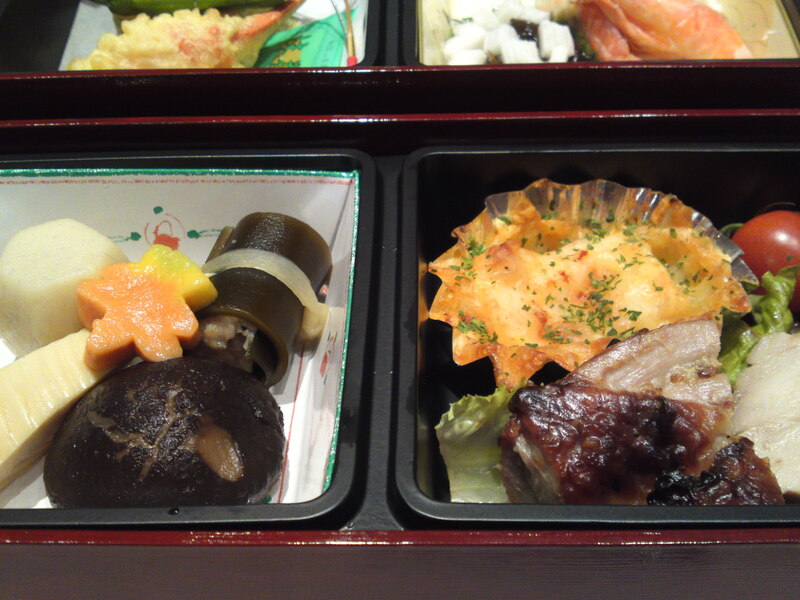 All (paying) guests were offered an excellent two-tier bento box! 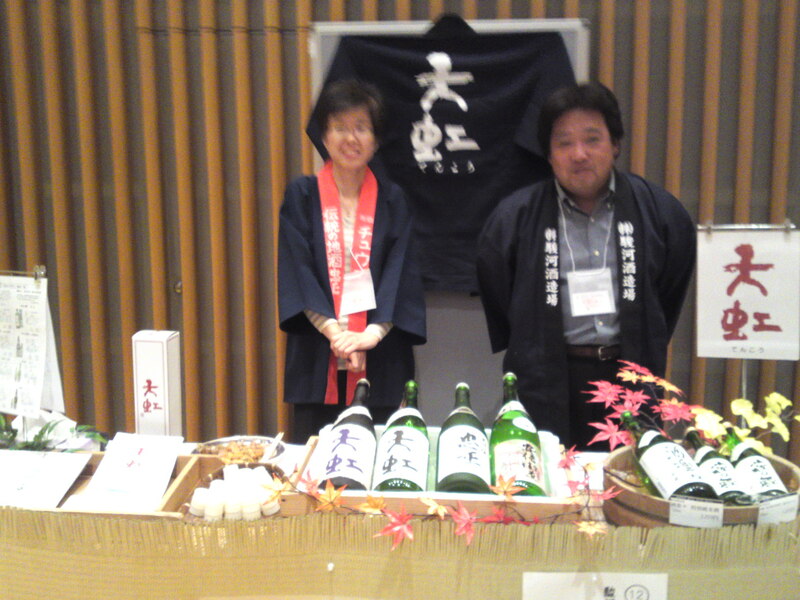 As for the kampai sake our table shared a honjyozo called “Yamatake Shirayuri/Mountain White Lily” by Makino Brewery in Fujinomiya City! Once again a great, if a bit short, day to enjoy great sake and great company! Not to mention all the new friends! Kokko Brewery in Fukuroi City holds a special place in the history of the sake of Shizuoka Prefecture as it was the first brewery to use the Shizuoka sake yeast which revolutionized the whole industry in Shizuoka and helped our Prefecture out of the doldrums (dregs) up to the very top in Japan! Usually the brewery does not write information apart of that required by law. Aroma: Fruity, dry, discreet. Bananas. Taste: Very dry attack backed up by strong and pleasant alcohol. Complex. Fruity: Bananas, coffee beans, dry almonds. Disappears fairly quickly with dry apricots and coffee beans, warming up the palate. Turns sweeter with food although makes a quick comeback to dry as soon as away from food again with more coffee beans and a note of dark chocolate. Overall: Very dry, even by Shizuoka standards. 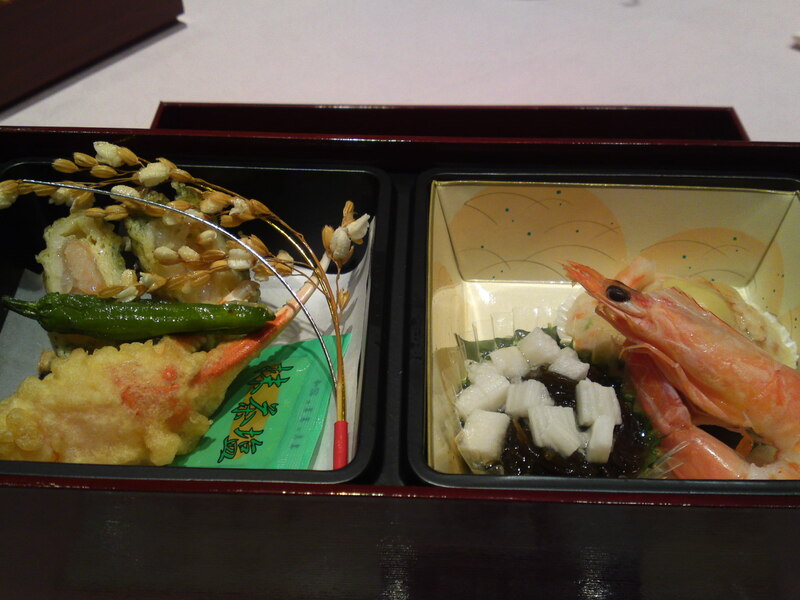 A ginjyou that marries beautifully with any food. Very sophisticated although its sharp character will please people looking for a sake off the beaten tracks, that is, in Shizuoka Prefecture! 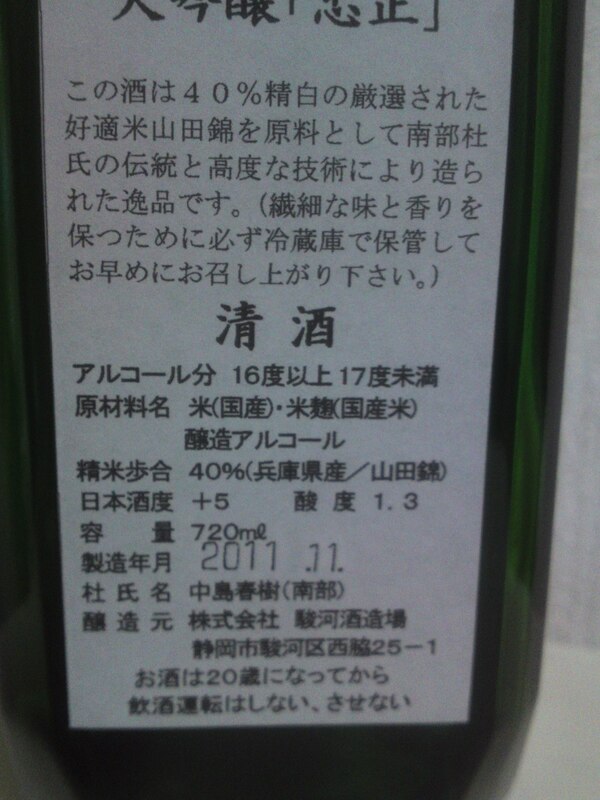 In spite of its ginjyou elevated status I would drink it with food, especially salads! 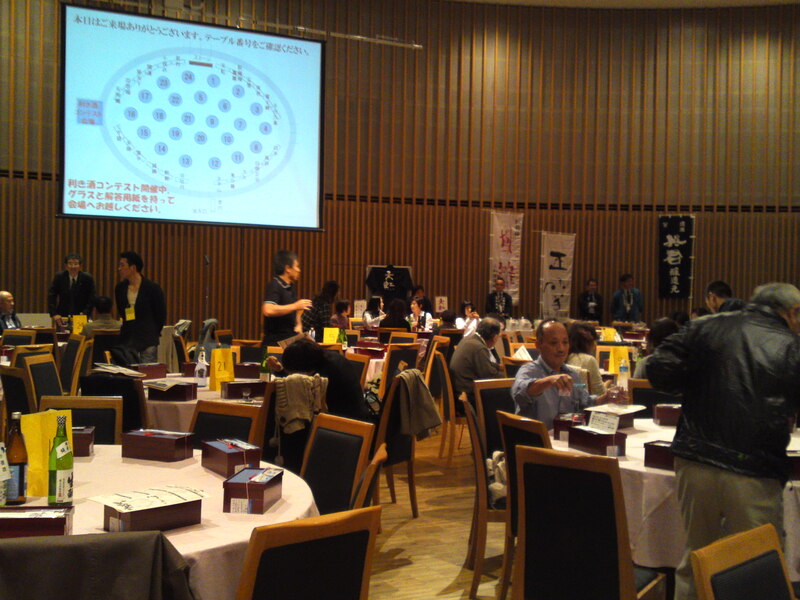 Shidaizumi Brewery in Fujieda City is not only celebrated for its great nectars but also for its research in all types of sake! They explained me that they do have a local clientele who exclusively drink their sake as futsushu/”normal sake” (as opposed to premium sake)! They also came up with this bright yellow label both in Japanese and English to appeal to local foreigners! 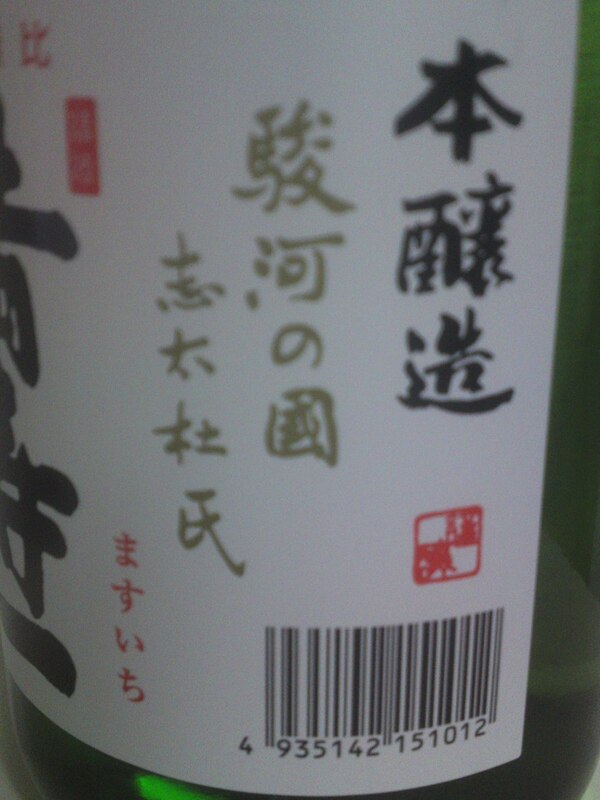 This sake is a Hiyaoroshi/ひやおろし, meaning it has been pasteurized only once! 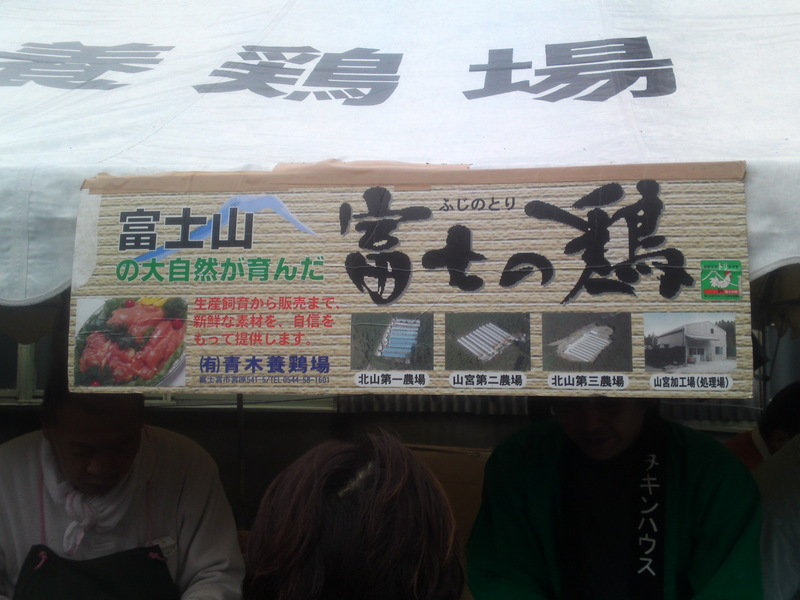 “Funeshibori/ふねしぼり” means that is has been pressed in a large rectangular vessel filled with bags of sake taken out of the fermenting vats. 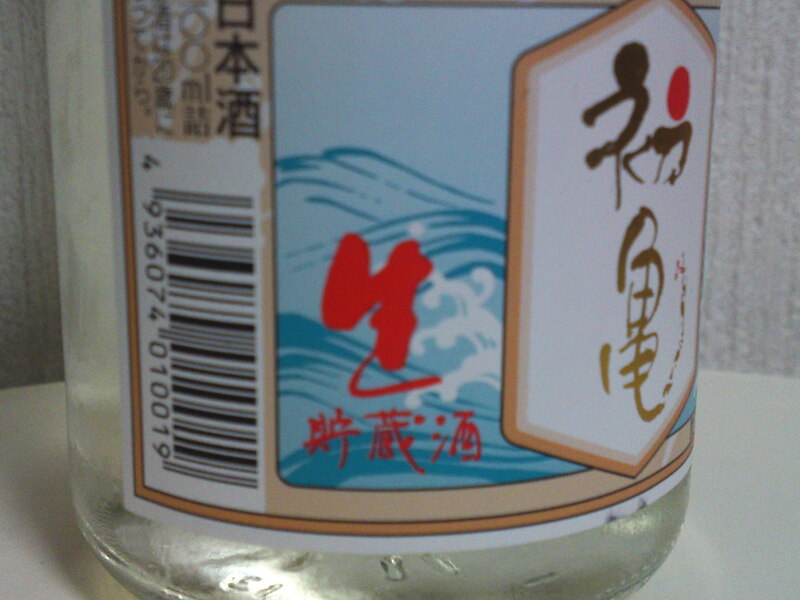 It is also a genshu/原酒 meaning that no pure water was added! Disappears fairly quickly with warmth spreading all over the palate. Complex. Dry but very fruity: Apricots, macadamia nuts, almonds. Very solid throughout. Varies little with food, except for an accentuated dryness with oranges. 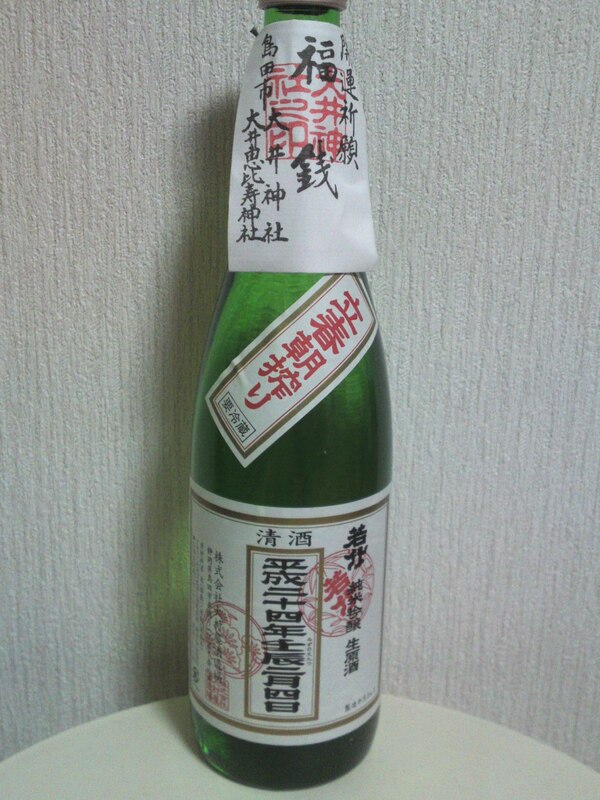 Overall: If futsushu, so-called normal sake, were all like this, there would little incentive to taste or buy premium sake! 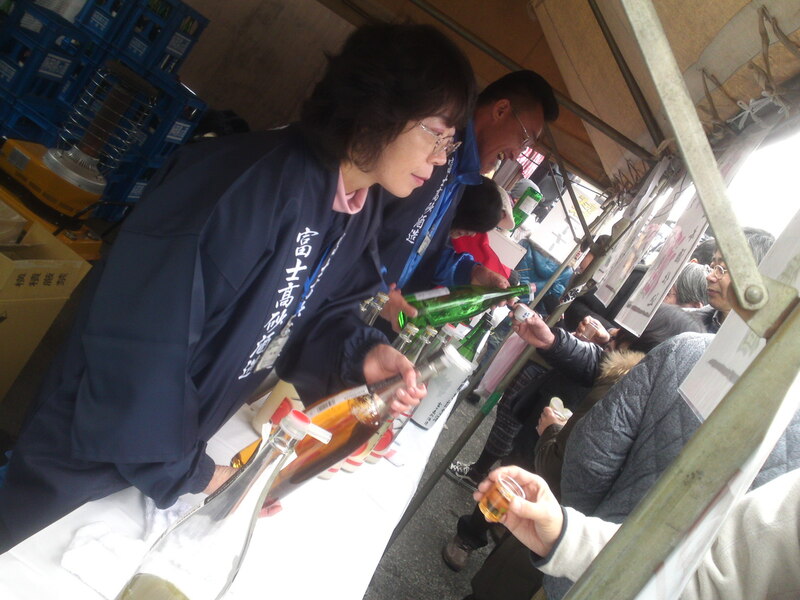 But this is Shizuoka Prefecture where all sake are extravagant as a matter of course! 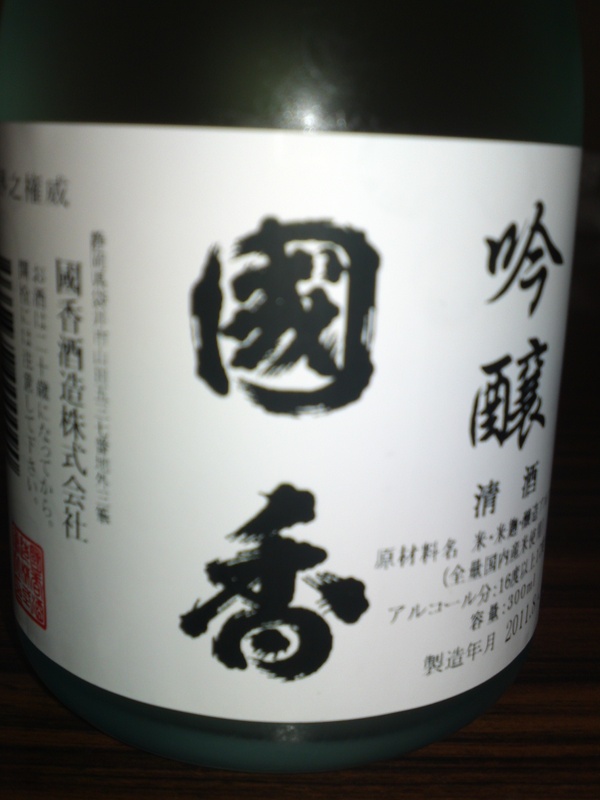 A sake you can savor with any food or on its own although it was obviously designed to accompany simple everyday meals! 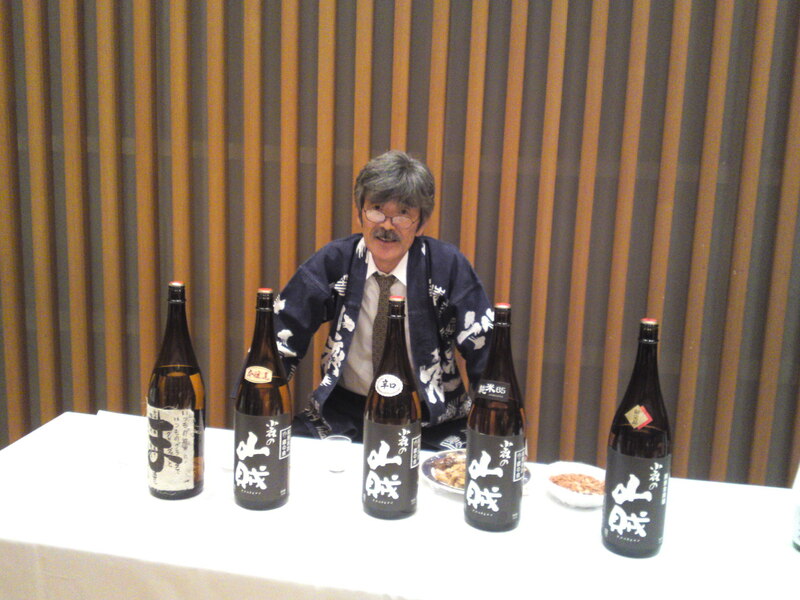 Hidetoshi Morimoto, owner-masterbrewer at Morimoto Brewery In Kikugawa City, began making koshu/古酒, old sake back in 2002 shortly after the taxation law changed from dues being perceived upon making sake to being levied upon sales only. But typically he used some of his best sakes to experiment in this new venture as demonstrated in this brew made in 2003 and released only this month: Junmai Ginjyo Genshu! 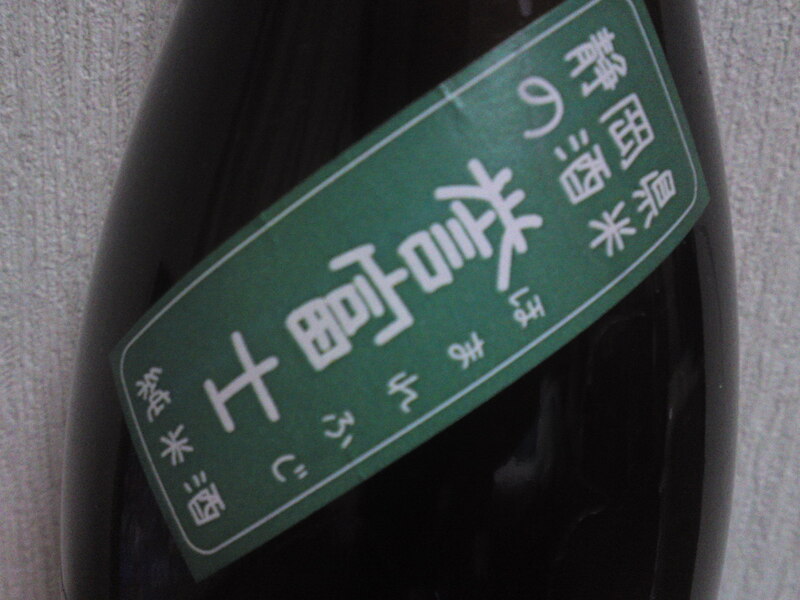 Taste: Dry attack backed by junmai petillant. Very deep, complex snd fruity. Coffee beans, dark chocolate, oranges, dark cherries. Turns slightly sweetish and deeper inside the palate. Disappears a bit slowly with a comforting feeling. Taste and texture closer to wine than sake. Overall: One might feel he/she was drinking wine if he/she hadn’t been told beforehand. Very reminiscent of a half dry sherry or even a Sauternes wine. 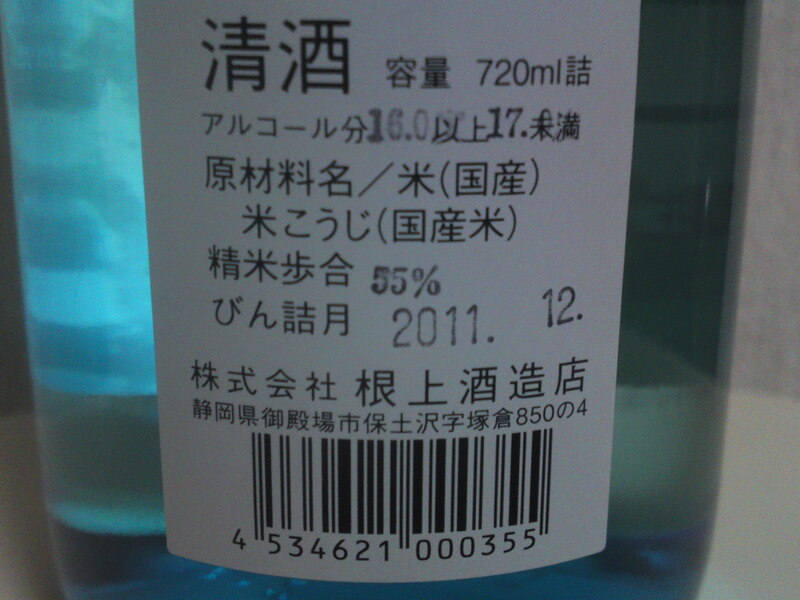 This is the second time I sampled this sake, although of a different year and I must admit I was flabbergasted! 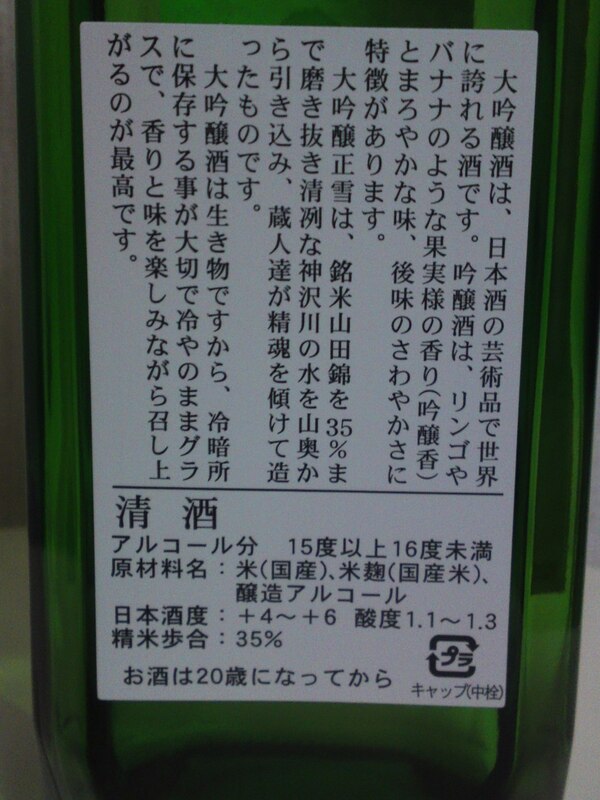 I drank it chilled, but I’m sure it would explode with more facets and faces if sampled lukewarm/nurukan! As it is a very limited edition I might have to order a few bottles and keep them sitting inside the fridge! Sugii Brewery in Fujieda City with Takashima Brewery in Numazu City and Morimoto Brewery in Kikugawa City is a member of what I have dubbed their group the “Maverick Band”. These three breweries have never been afraid of experimenting away from the more conservative breweries in our Prefecture. 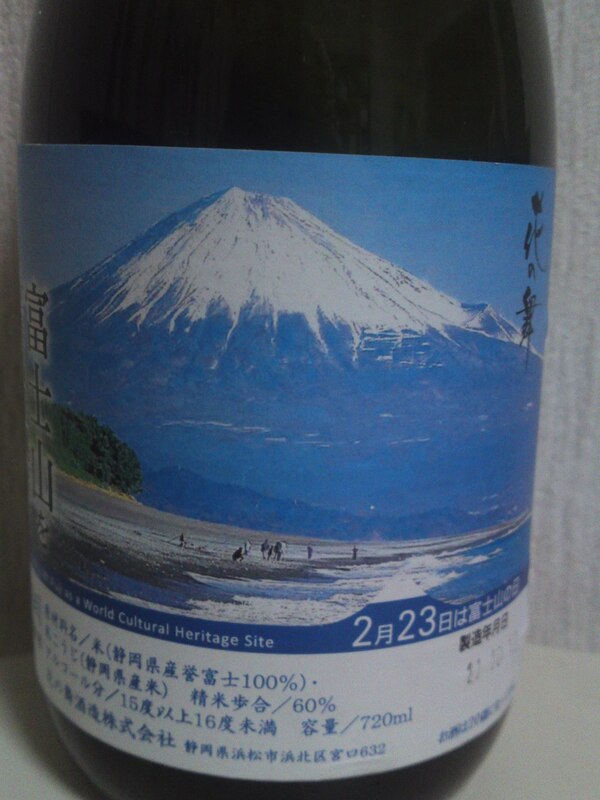 This particular brew was made with locally grown Homare Fuji Sake rice. 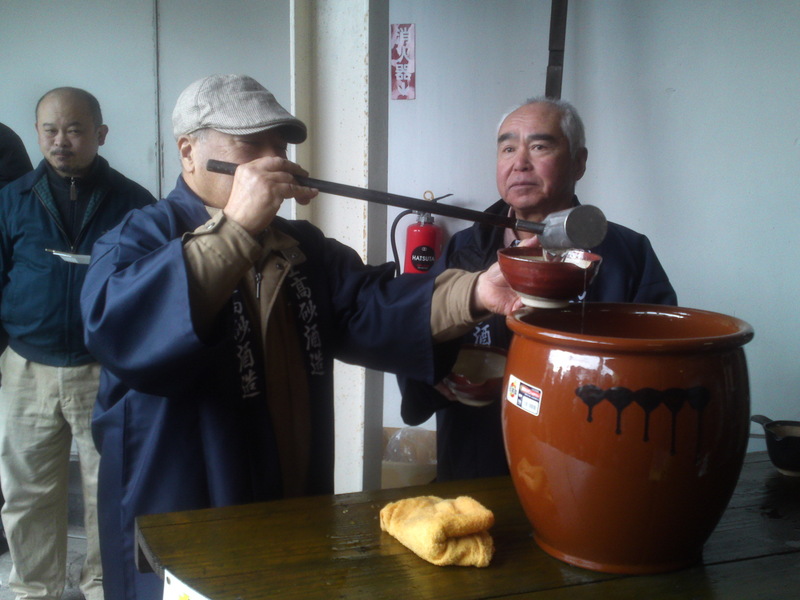 As for the fermenting process it was done according to the ancient methods prevalent in the Edo Period when breweries left more responsibility to the environmental nature. The difference is that it was better controlled than in ancient times! 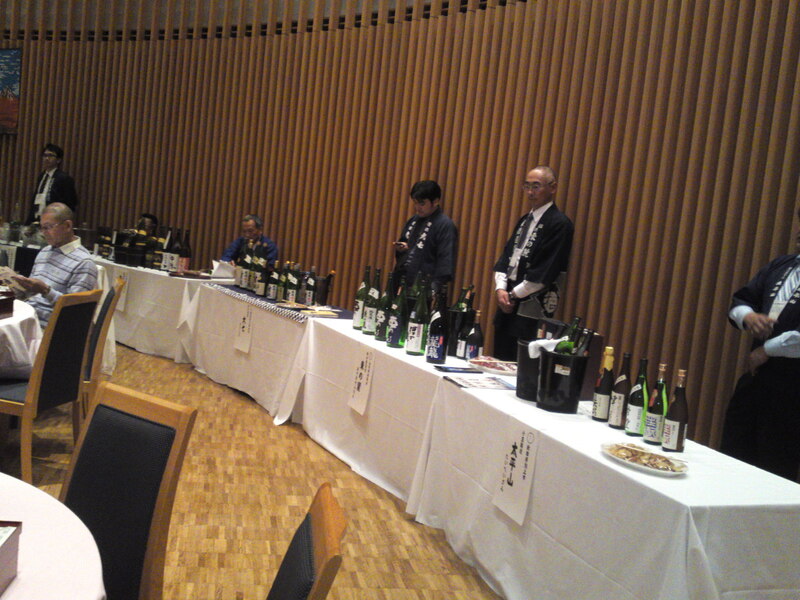 Taste: Strong junmai petillant attack backed up with a lot of fruit: mandarines, almonds. Disappears with more oranges, coffee beans, bitter chocolate and dark cherries. Junmai petillant staying strong all the way. Ends up on an even drier note with further sips. Takes a bit of a step back with food with an even stronger dry and acid accent. Very complex and revealing more facets with the next sip. 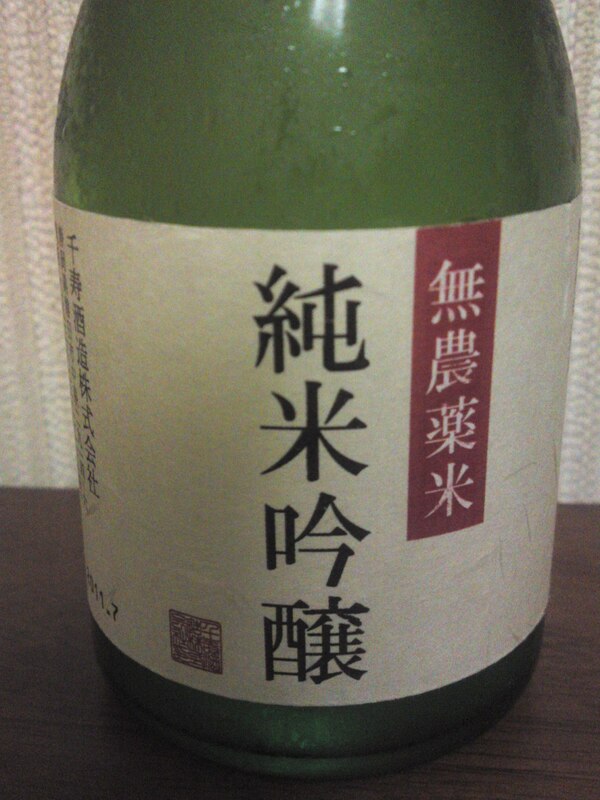 Overall: Although a sake very untypical of Shizuoka Prefecture, it is a typical brew of Sugii Brewery! 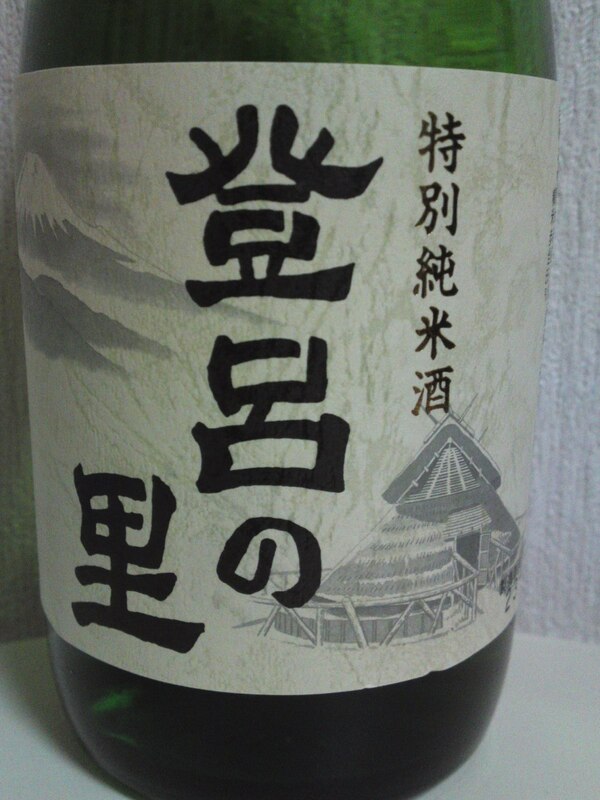 A complex, surprising and very pleasant sake, best appreciated on its own at room temperature or “nurukan/lukewarm”, although a long distance away from the beaten tracks. Difficult to categorize but so intriguing. A true experience on a new path!